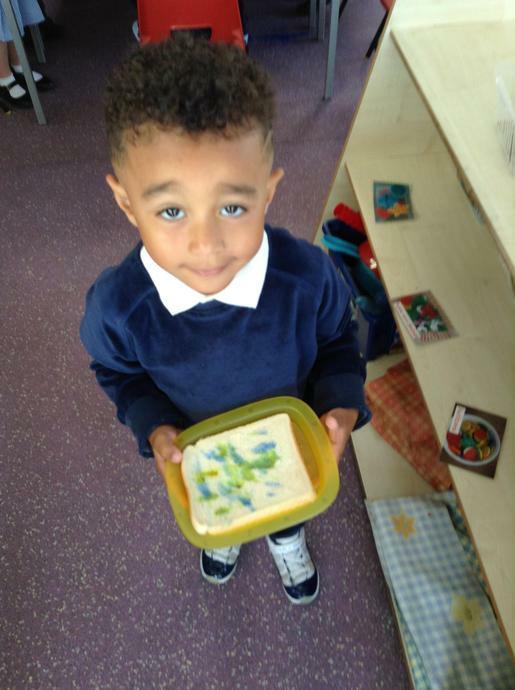 This term is all about where water comes from and what we use water for. 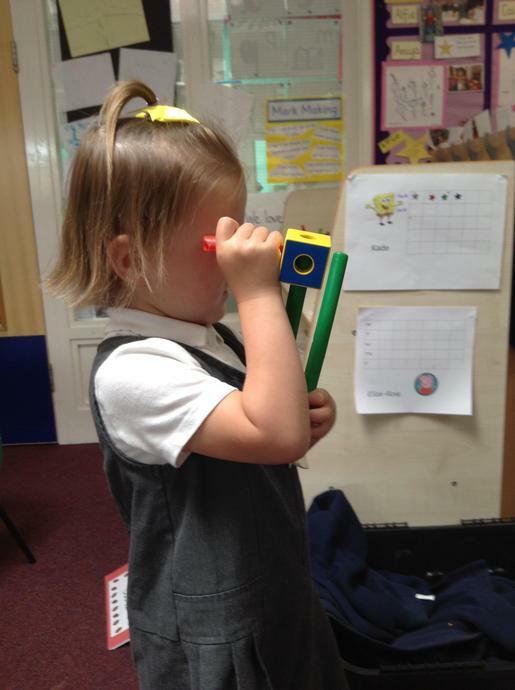 Week 1 & 2 - What can we see through the telescope? 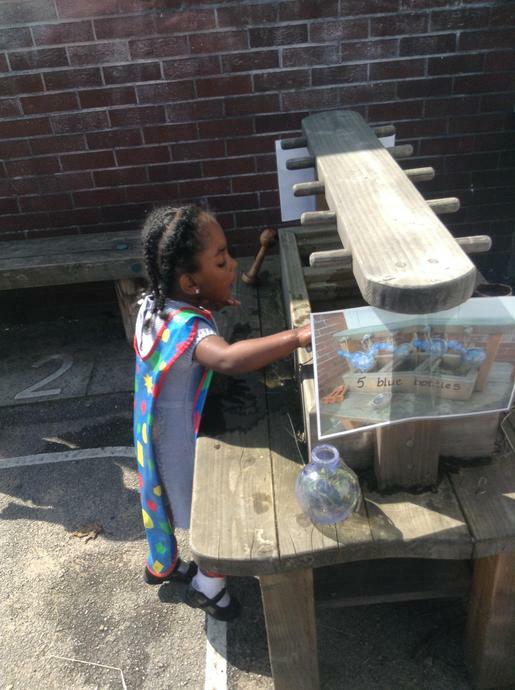 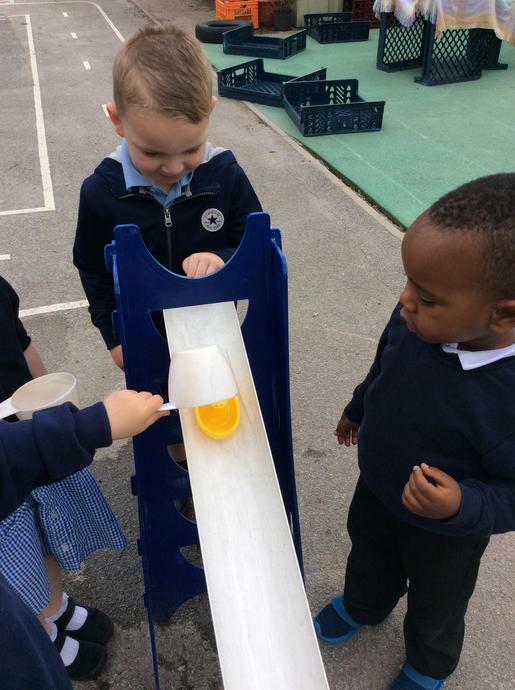 Week 3 & 4 - What can we do with water? 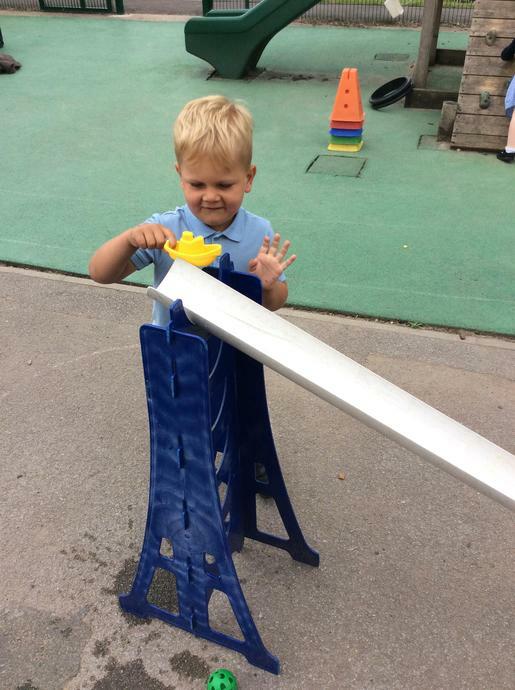 Week 5 & 6 - How can we have fun with water? 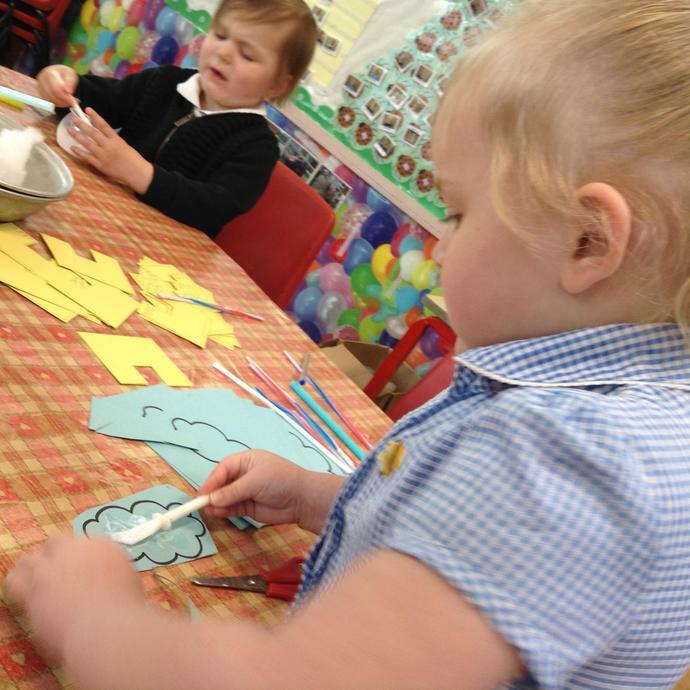 Week 7 & 8 - Where does rain come from? 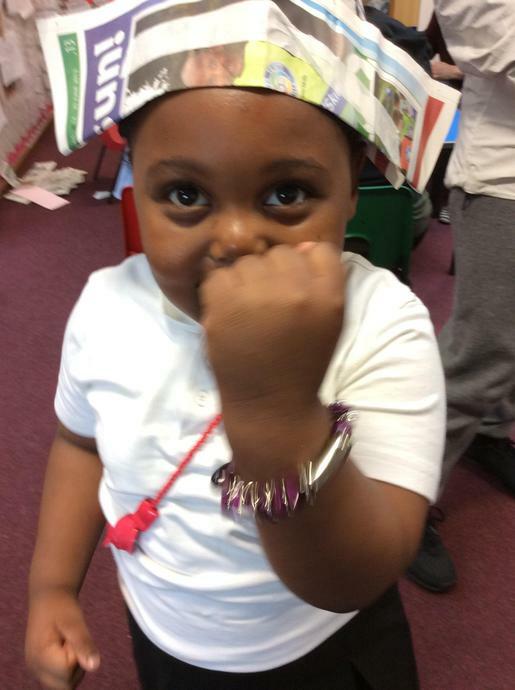 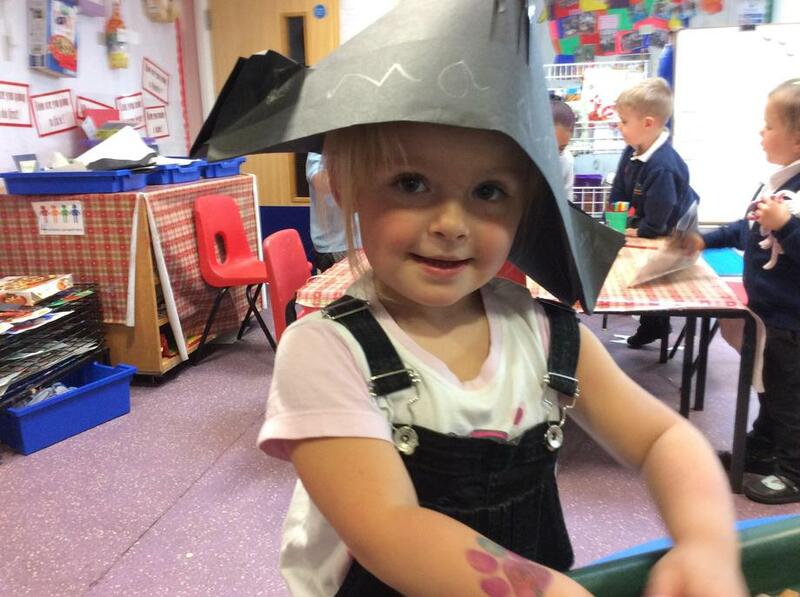 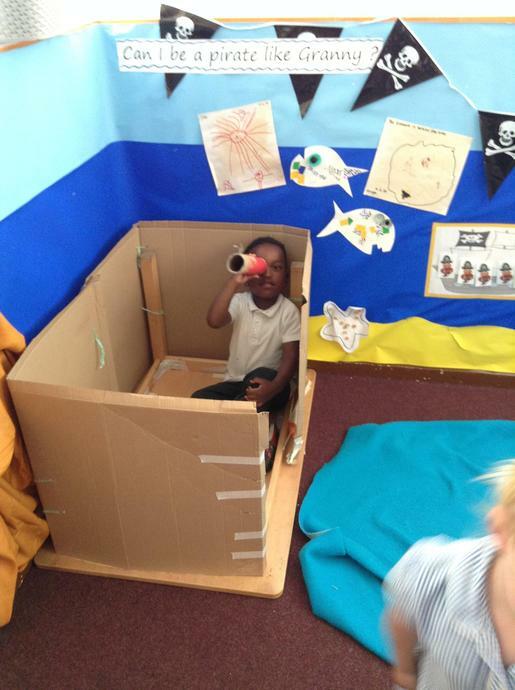 We focussed on pirates and treasure! 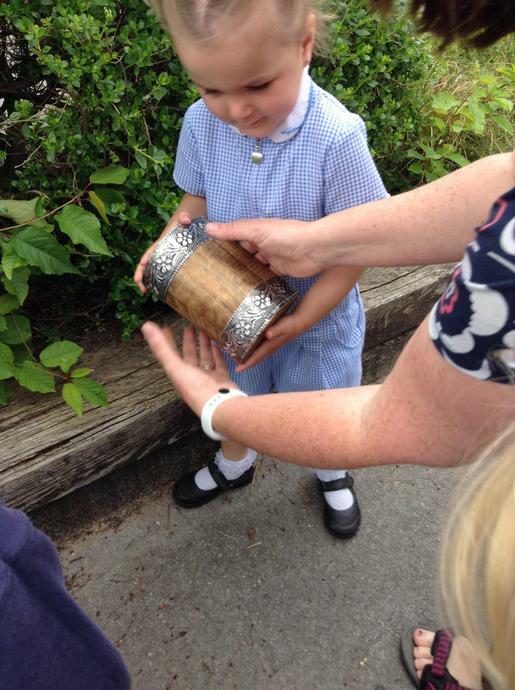 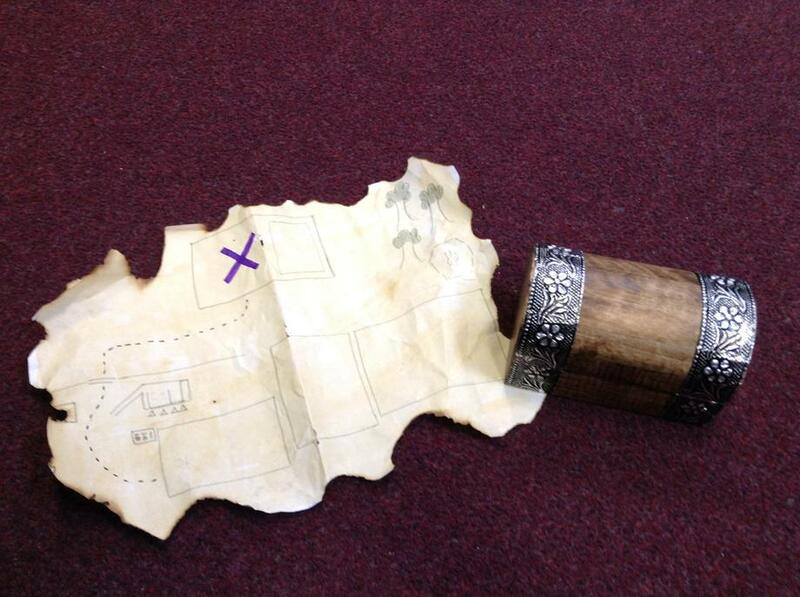 We were left a treasure map from a Pirate...we followed the map and found the treasure box in a bush! 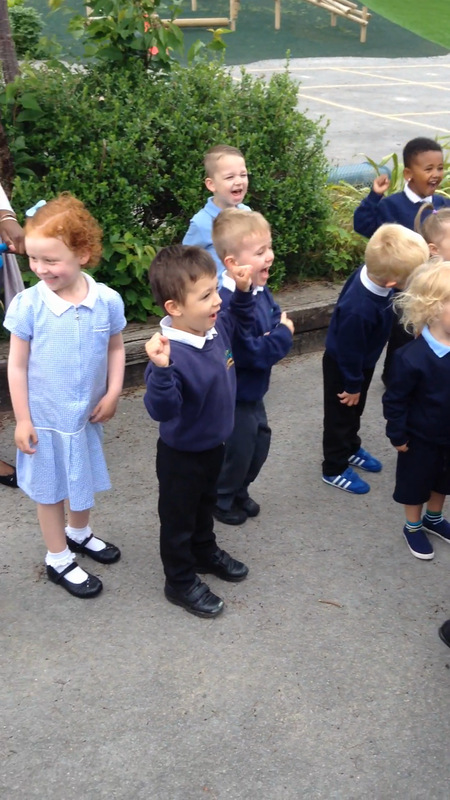 We were all very excited! 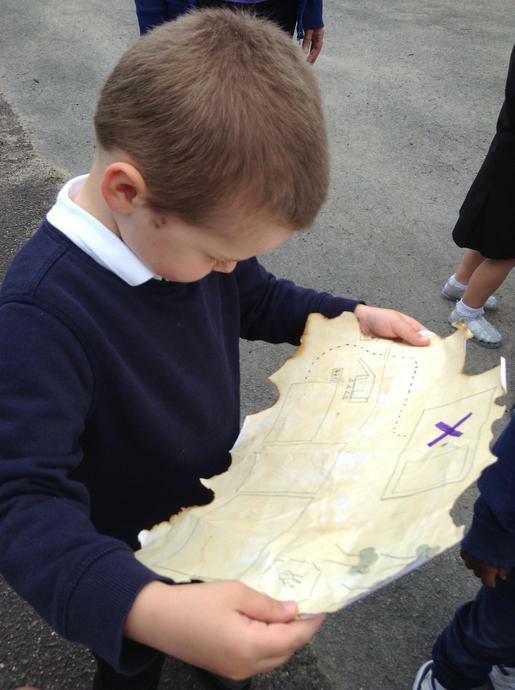 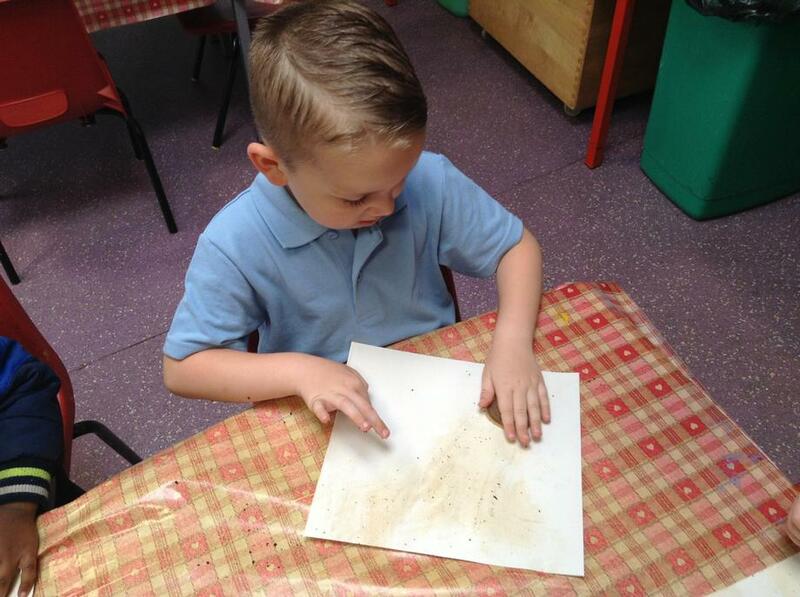 We made our own treasure maps, making them look old using tea bags! 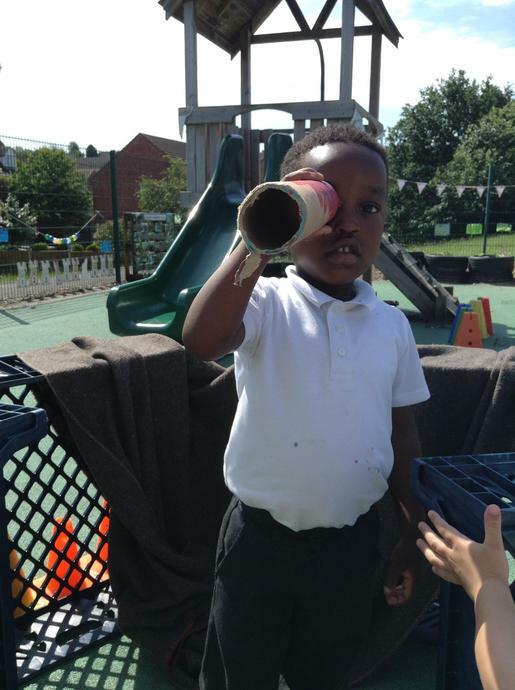 We also wrote a message in a bottle to the pirate telling him where we had found the treasure. 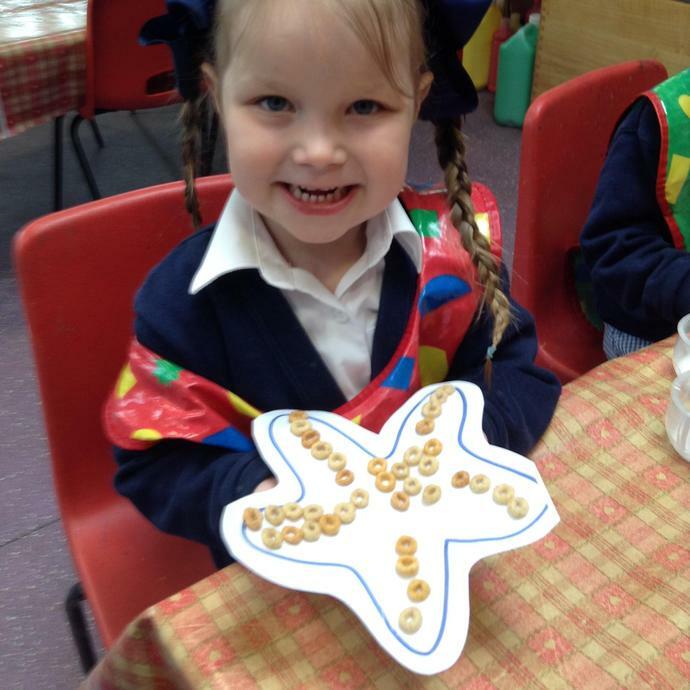 We thought about what might live under the sea, creating a star fish with cheerio suckers! 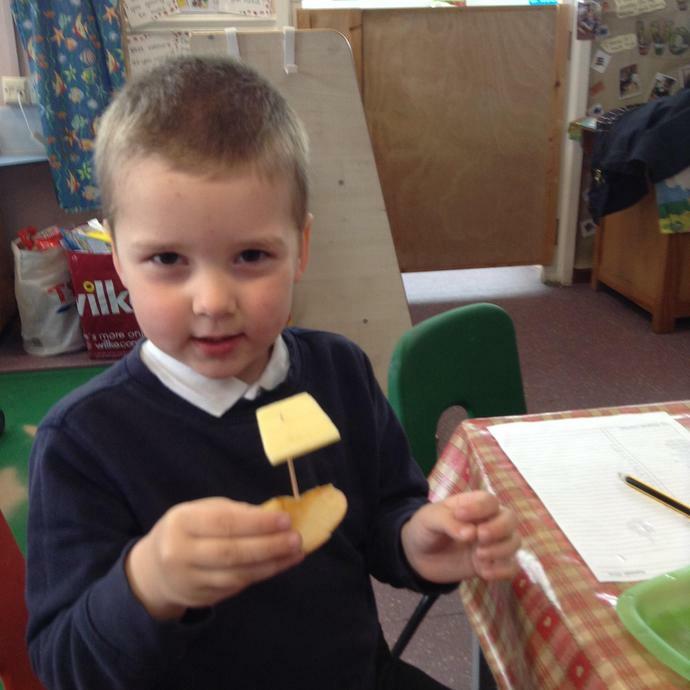 We made Pirate grog in the potion station, made apple and cheese boats and weighed different boxes of treasure to see which was the heaviest. 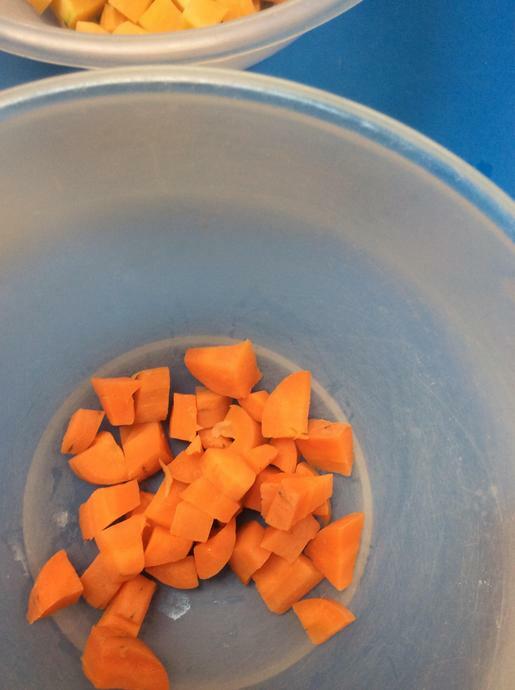 Week 3 & 4 - What can we use water for? 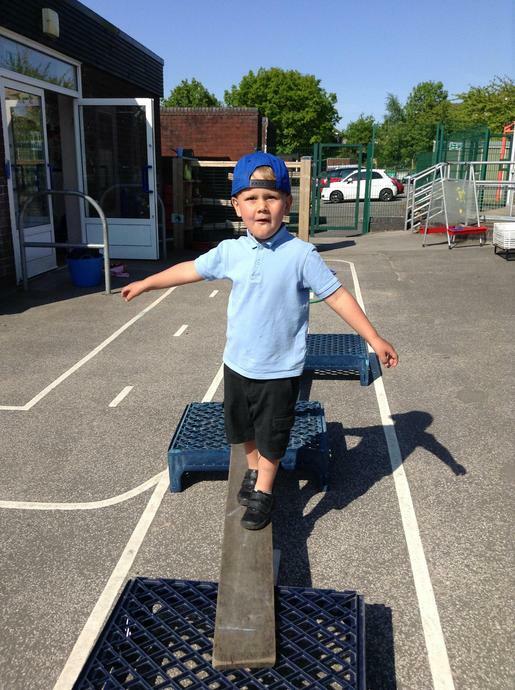 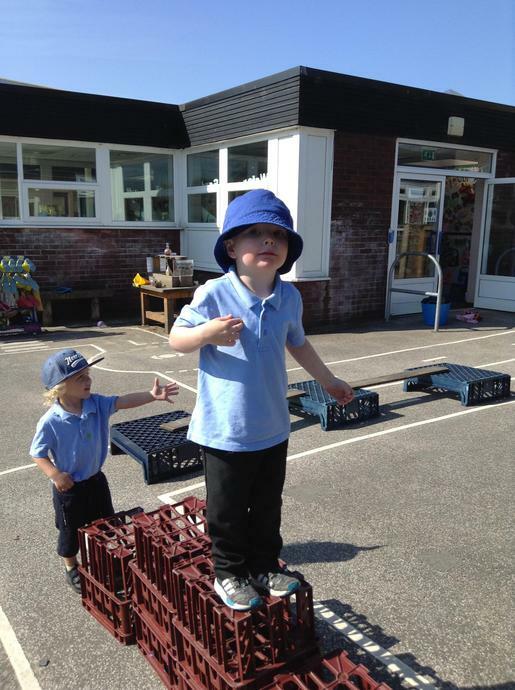 We investigated what was meant by 'floating and sinking'. 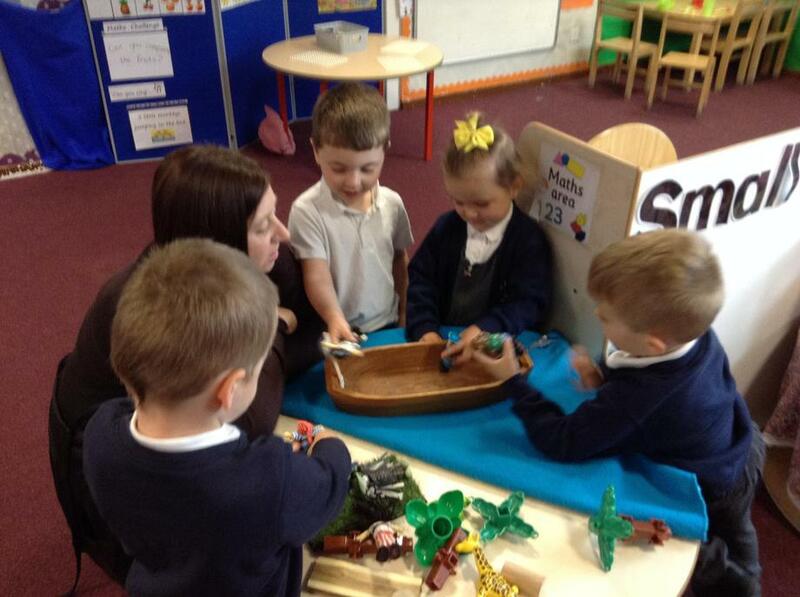 We looked at different objects and presicted whether we thought they would float or sink. 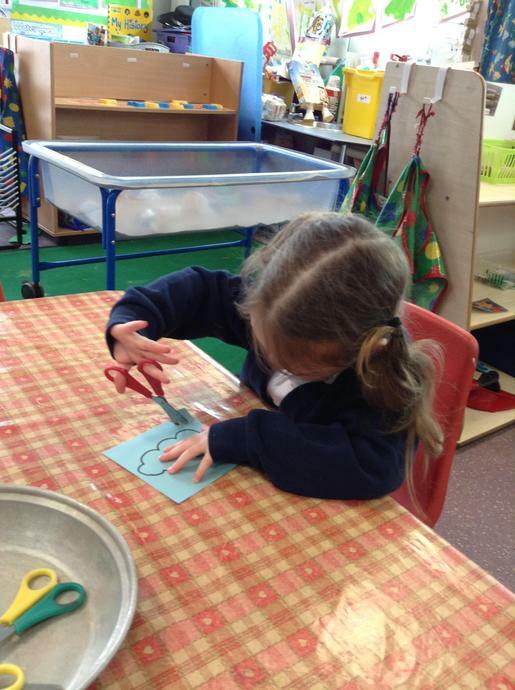 We began to think about what might make an object sink. 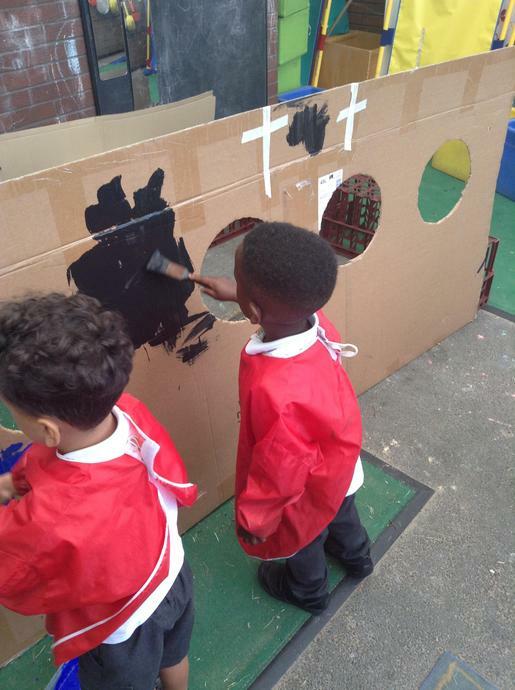 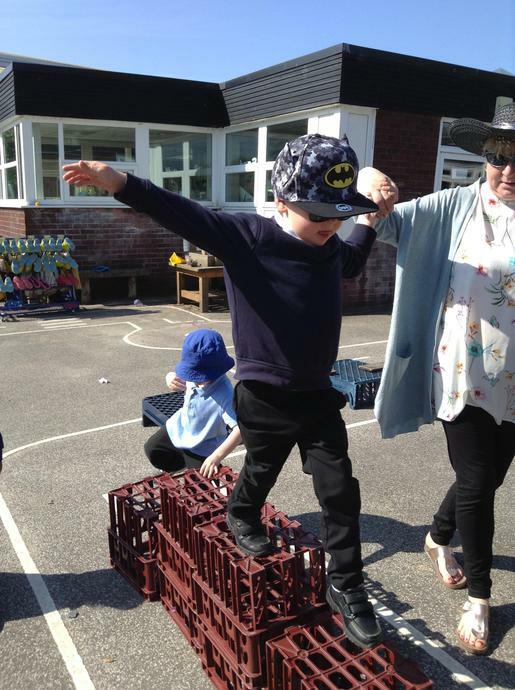 We made our own boats from the recycled boxes. 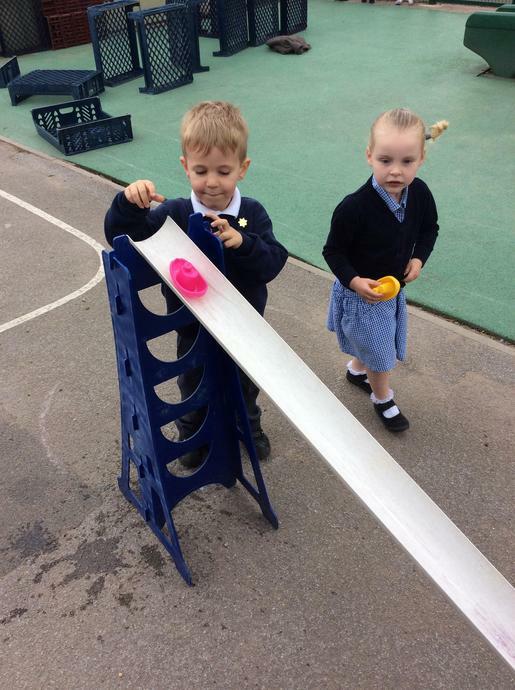 We also used our number skills to count how far the boat would travel dorn the slope. 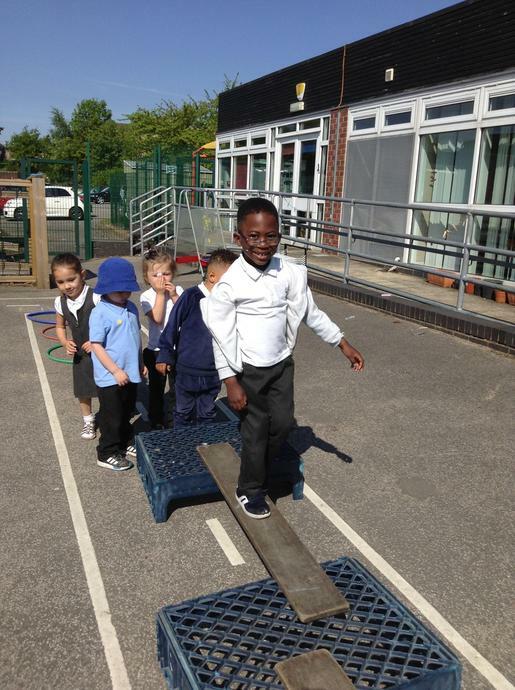 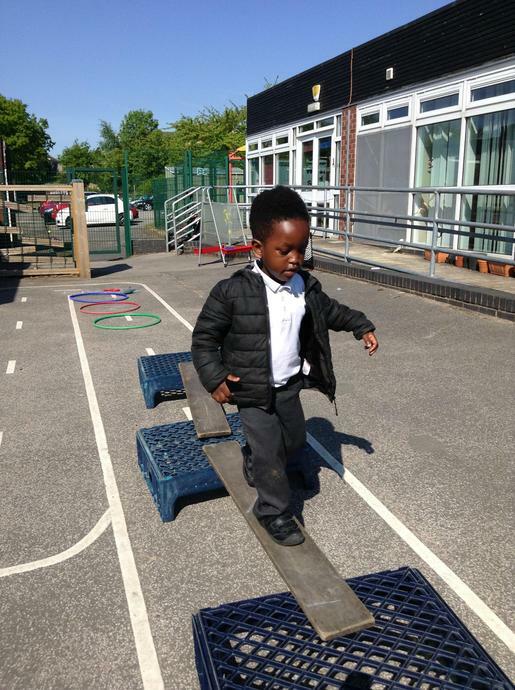 We looked at whether water would make the boat travel further. 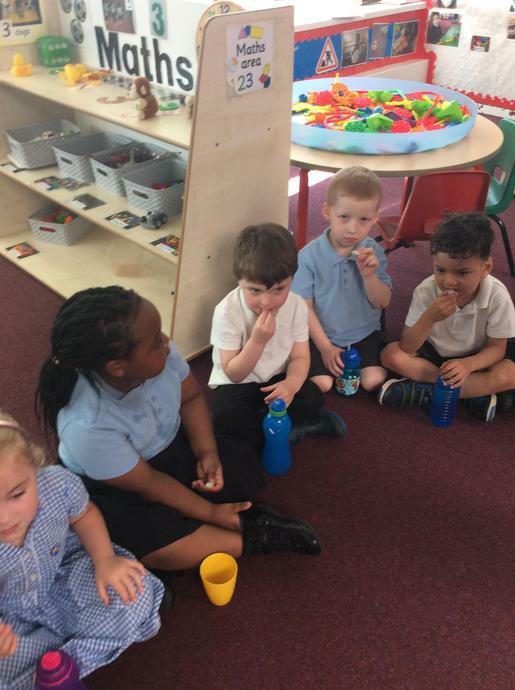 Lots of lovely counting and speaking about what they found. 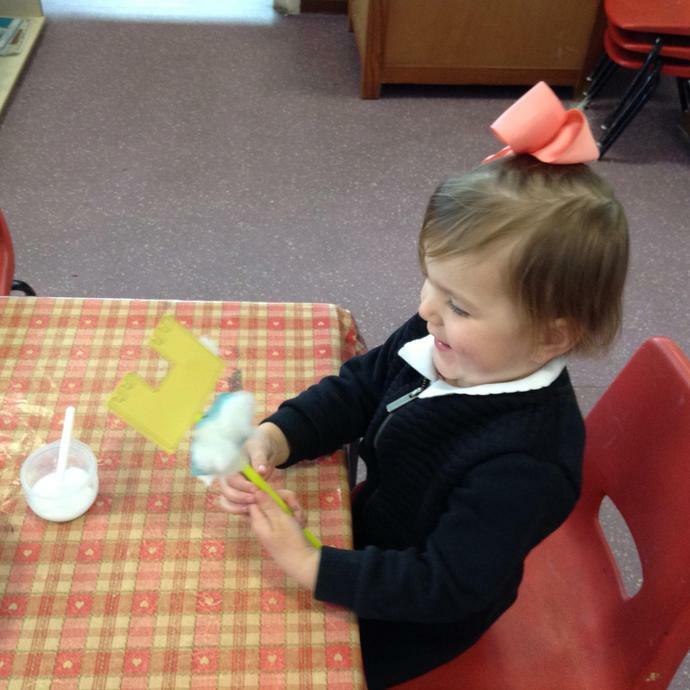 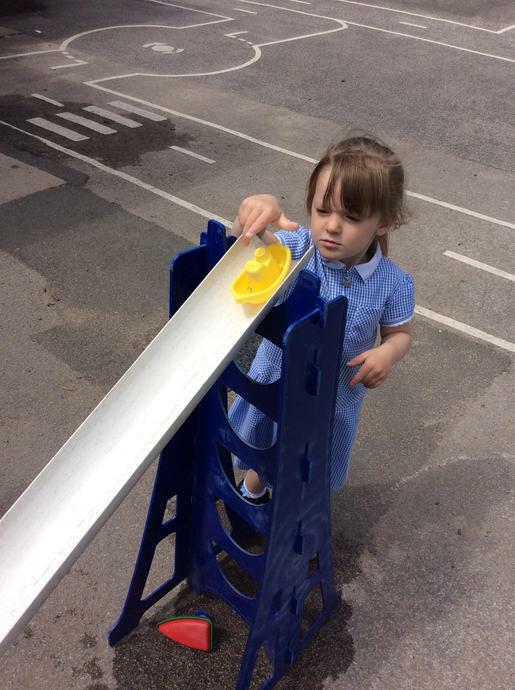 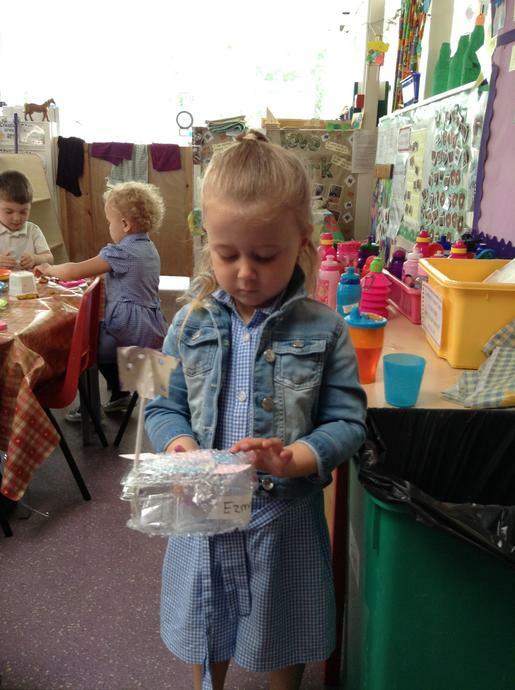 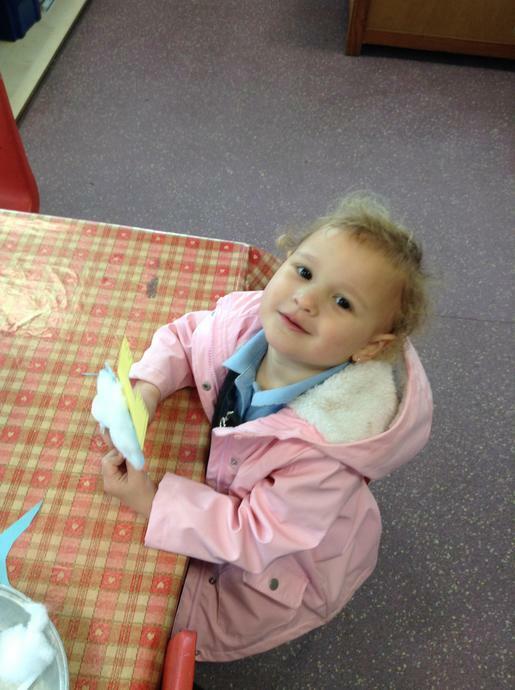 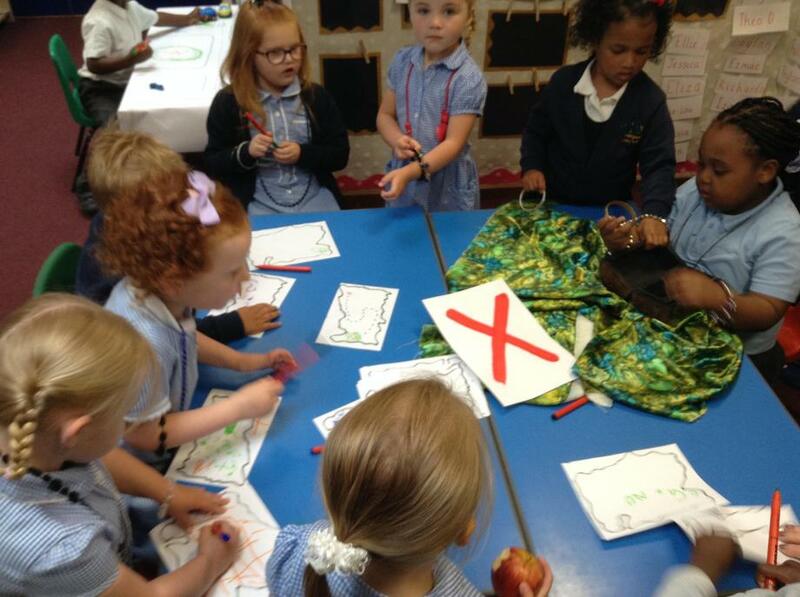 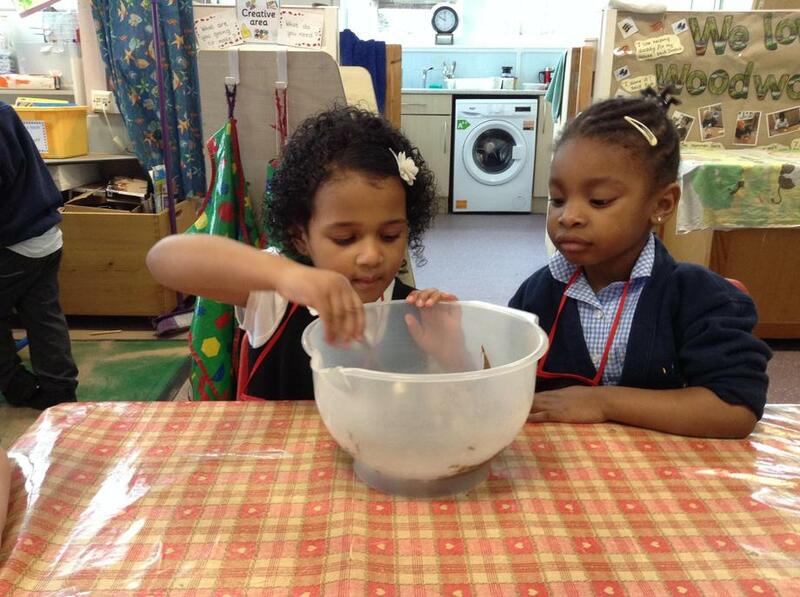 Ladybirds enjoyed guessing whether an object would sink or float. 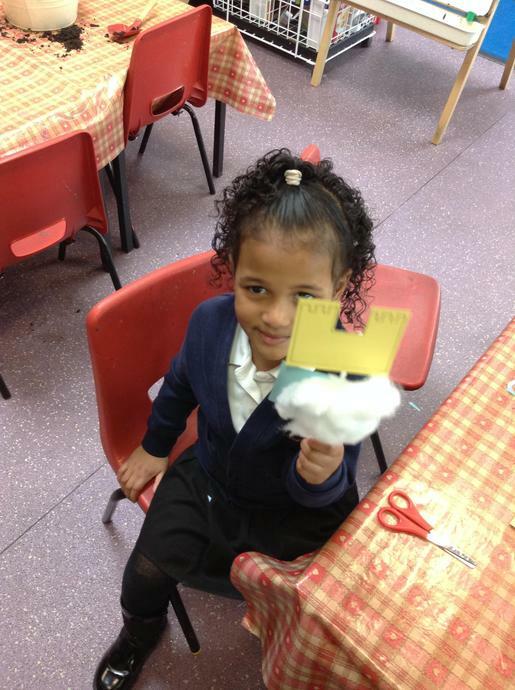 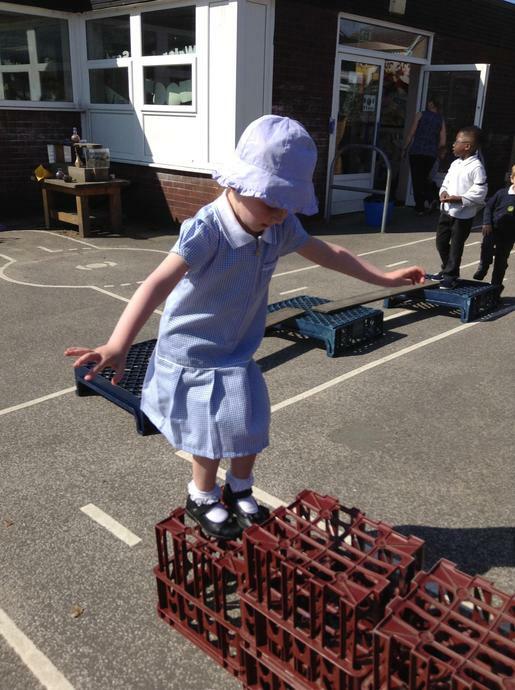 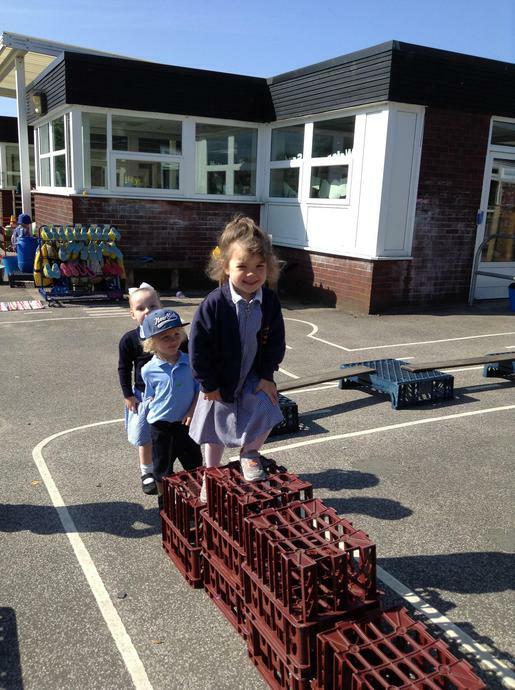 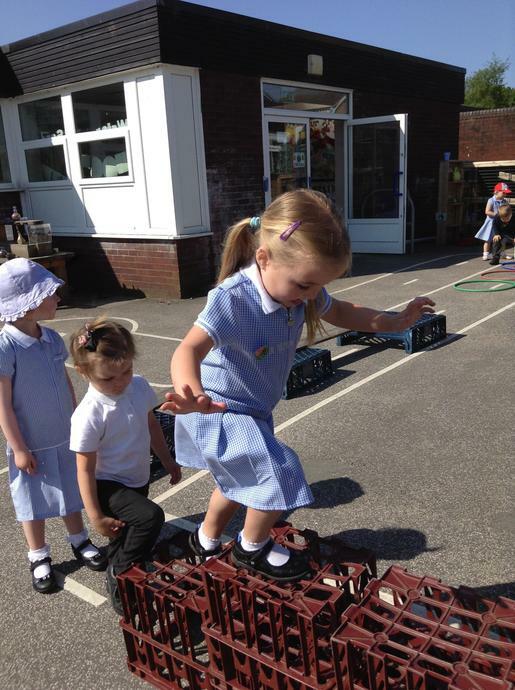 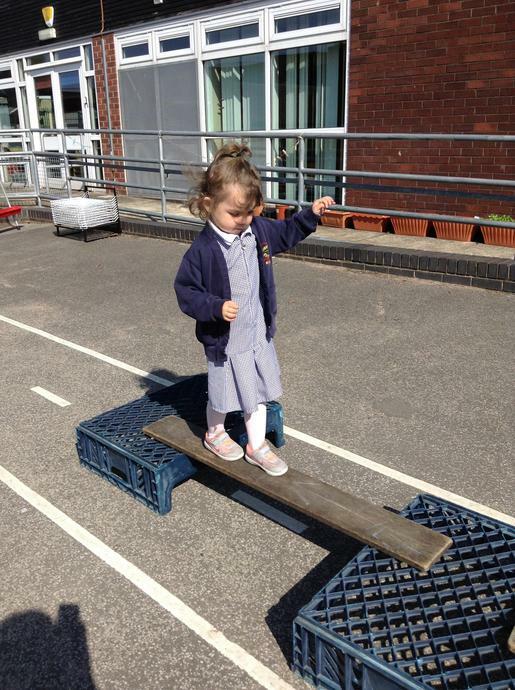 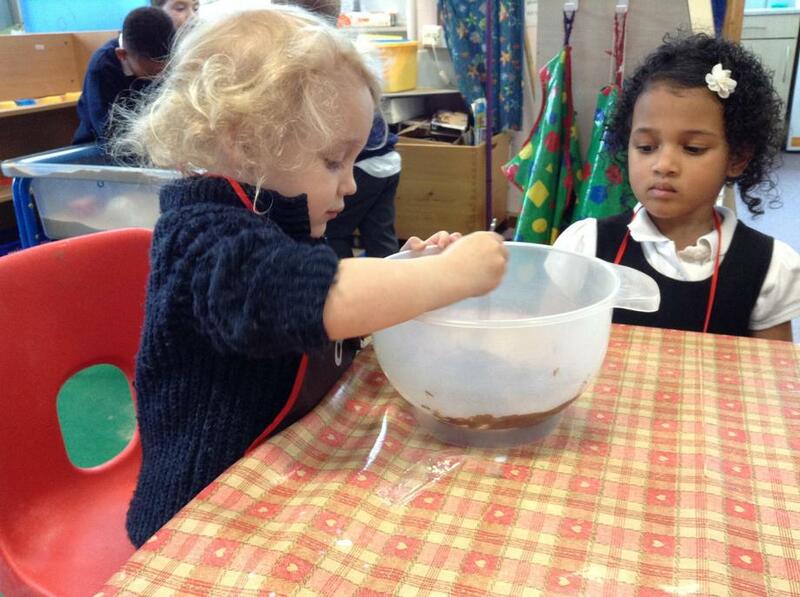 Ladybirds had great ideas about how things float or sink. 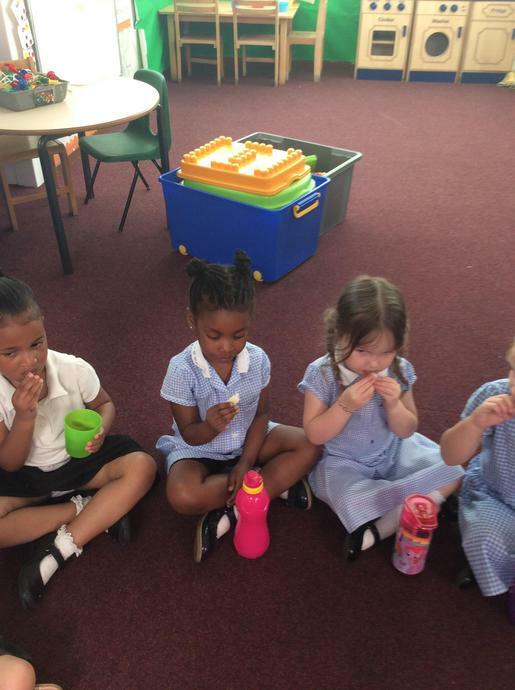 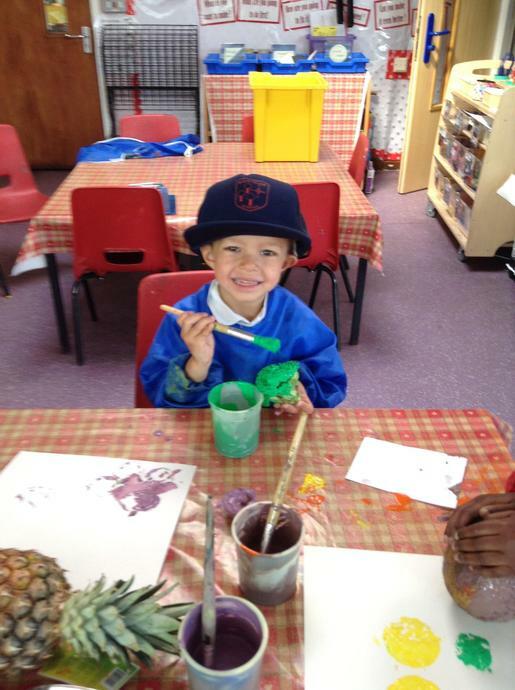 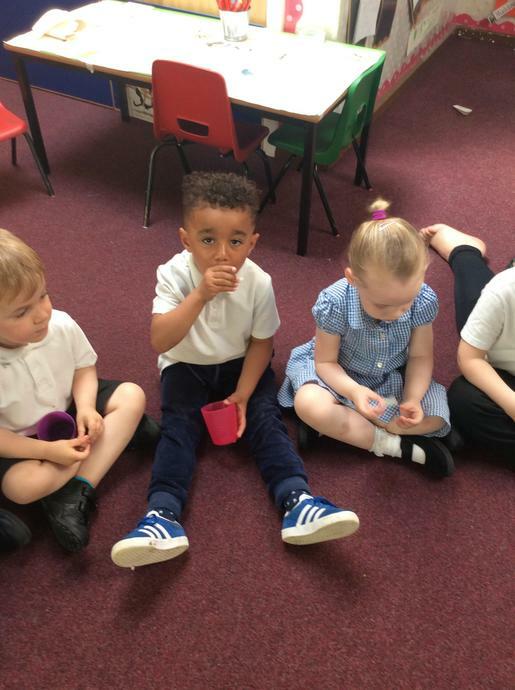 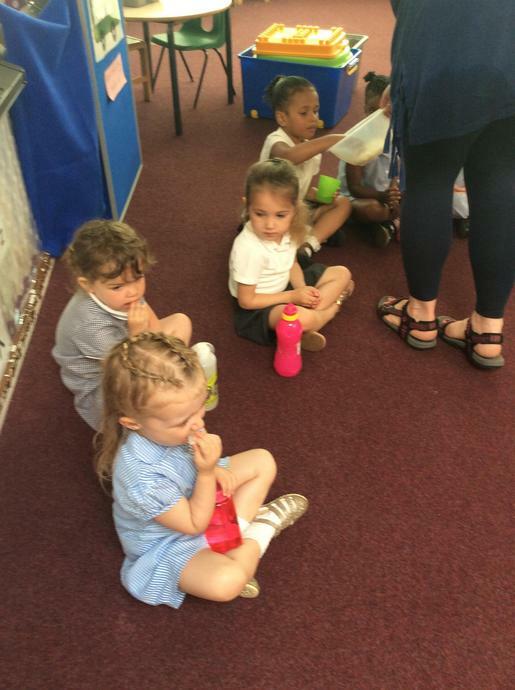 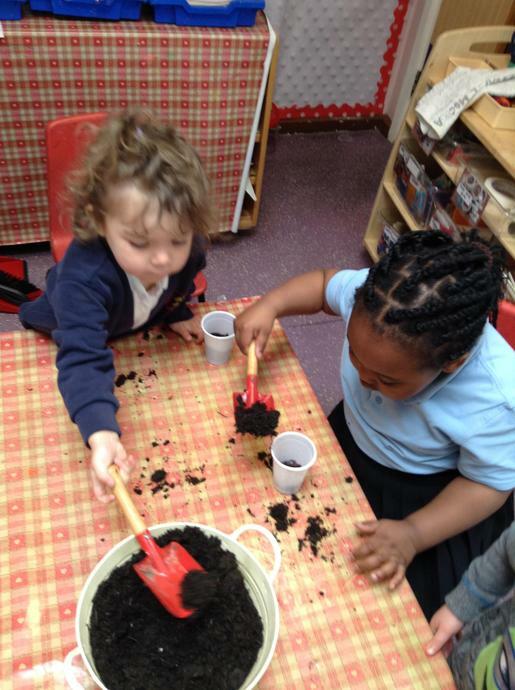 This term we are finding out 'All about Growing!'. 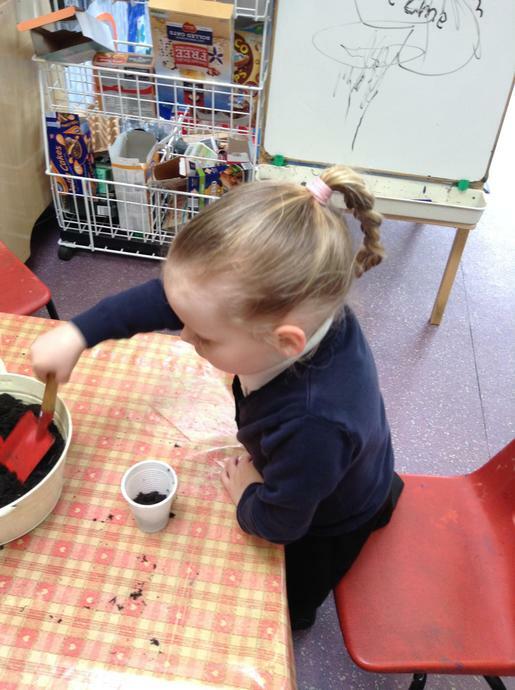 We have broken our weeks up in the term into three parts to look at the different aspects of growing. 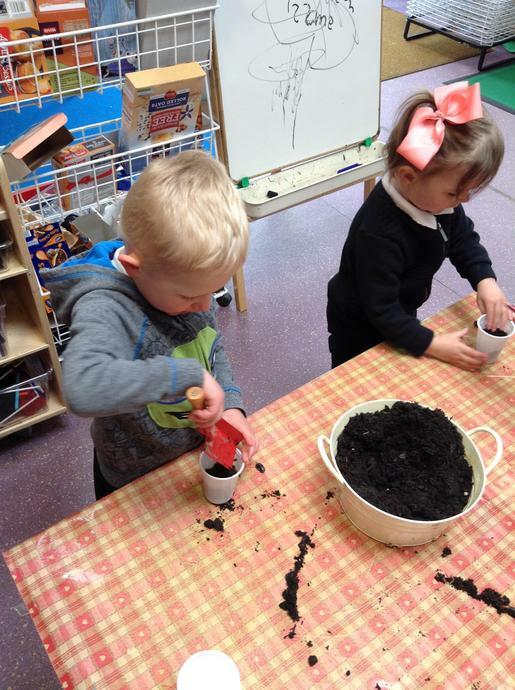 We will be undertaking lots of planting that our Ladybirds will be bringing home for you to continue to watch grow....remember to keep watering them though! 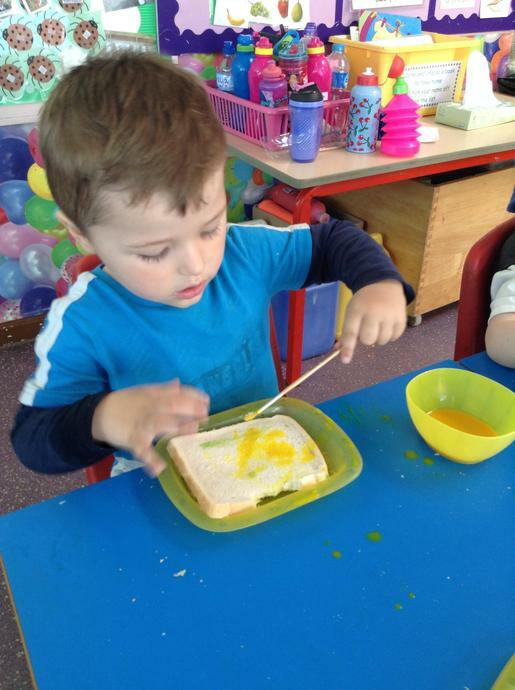 Week 1 & 2 - What lays eggs? 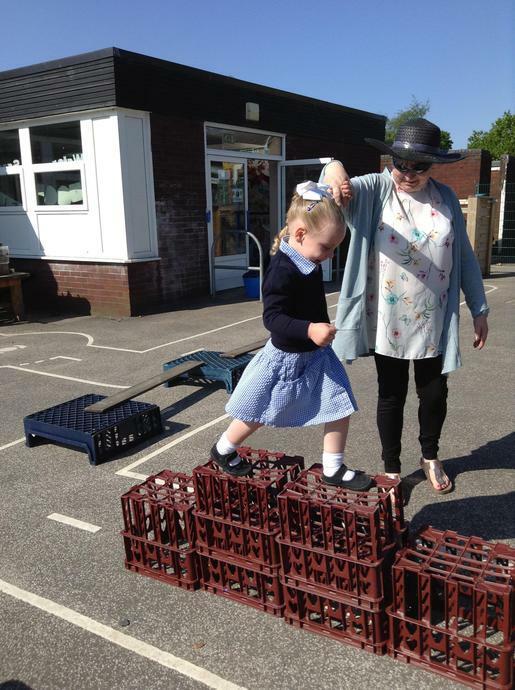 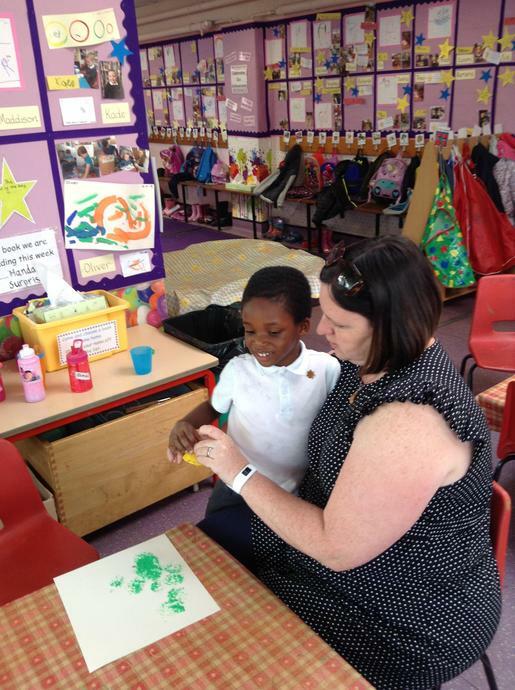 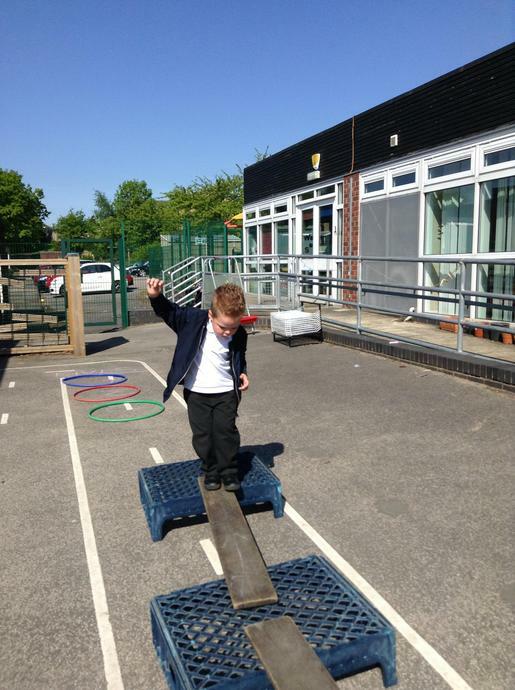 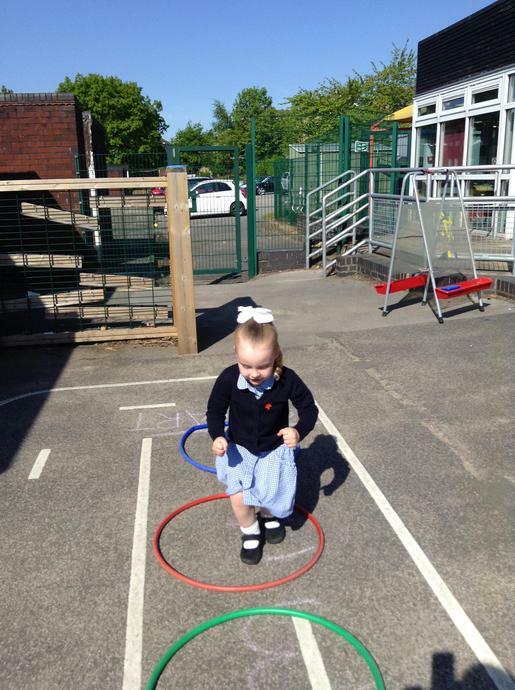 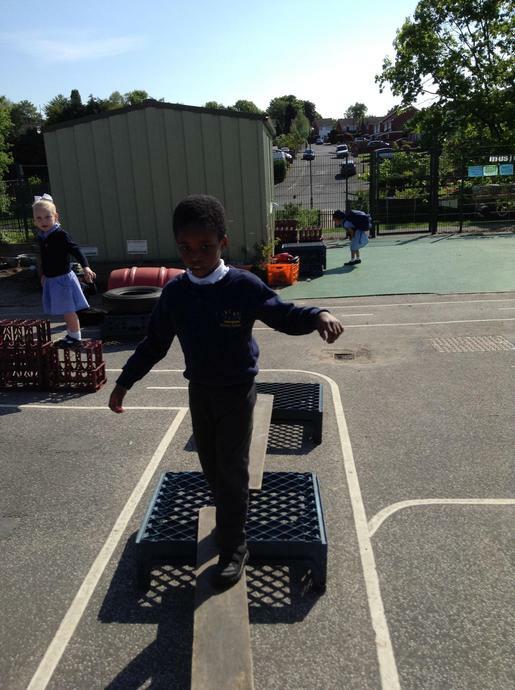 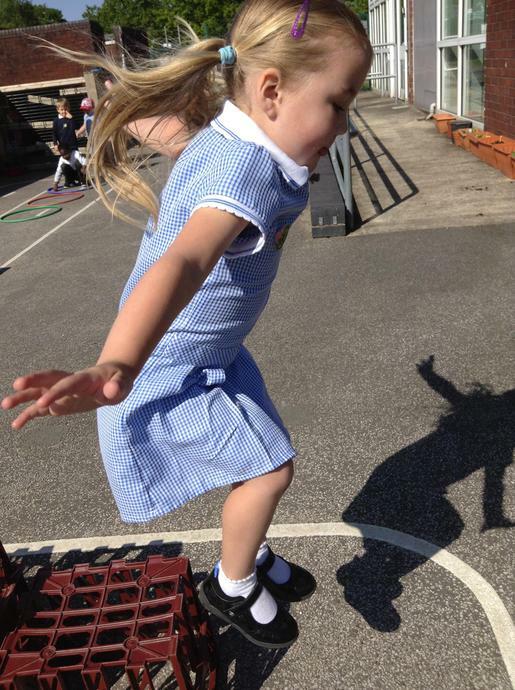 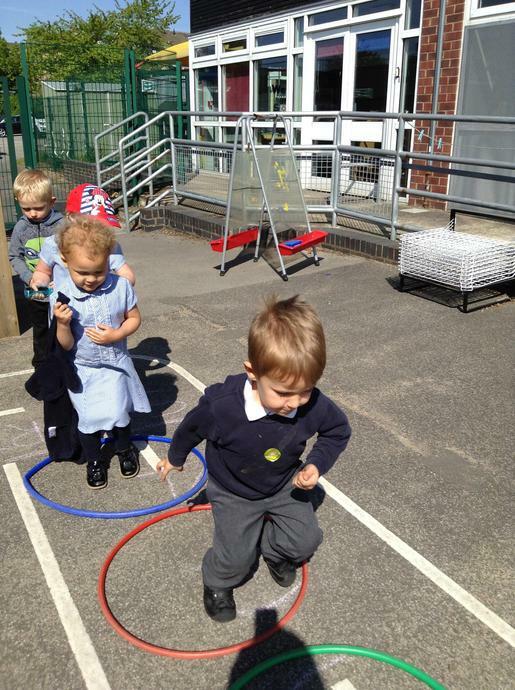 The children were very excited to be back and enjoy the sunshine. 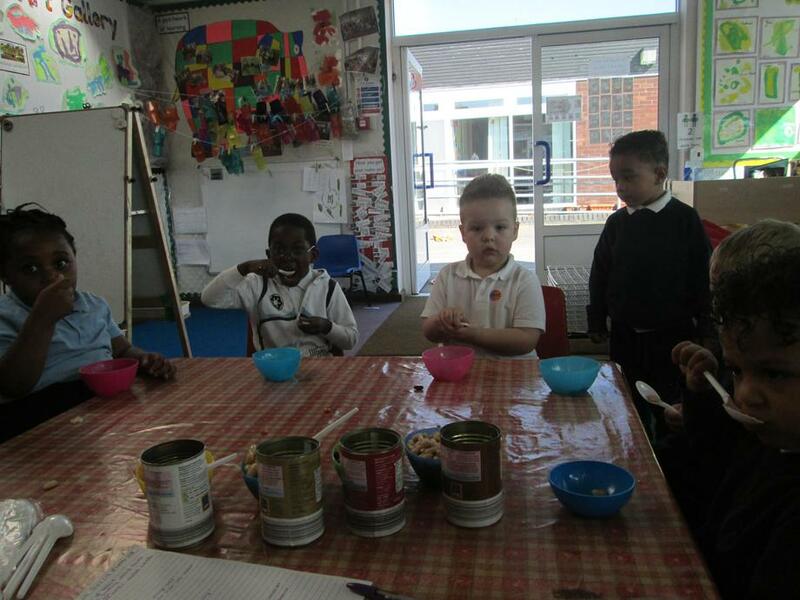 We read the Very Hungry Caterpillar story, focussing on retelling the story and encouraging the children to join in with the repeated phrases. 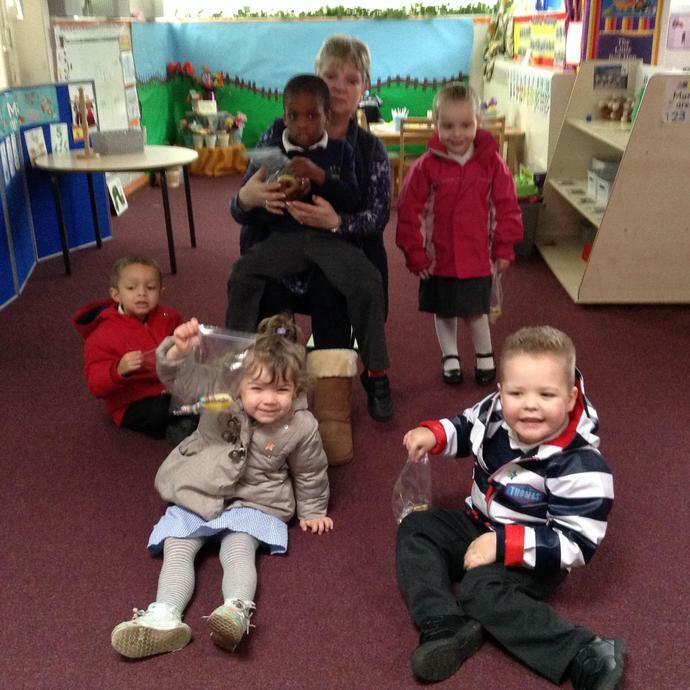 By the end of the two weeks, the children could explain the lifecycles of butterflies and frogs! 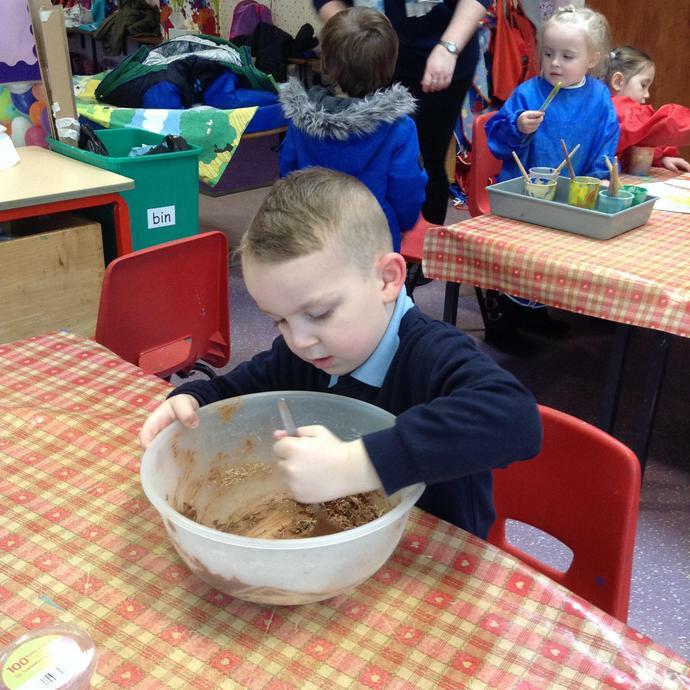 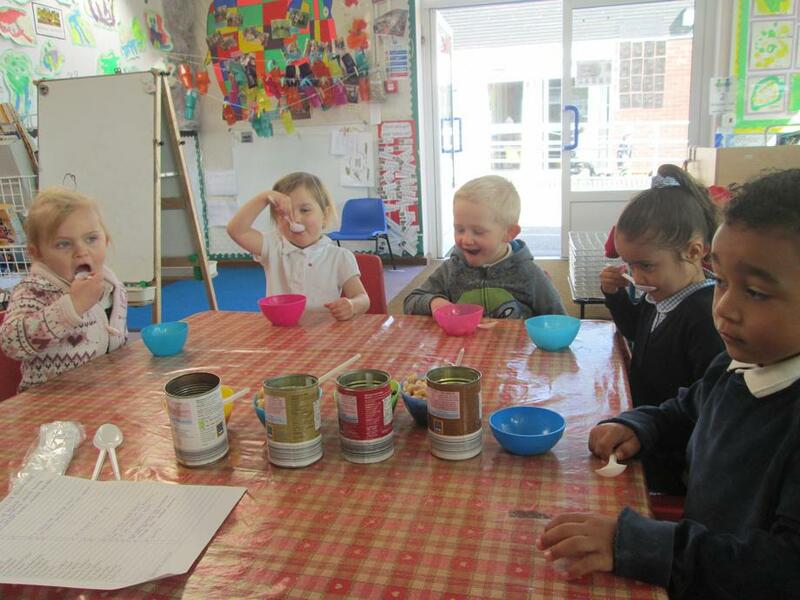 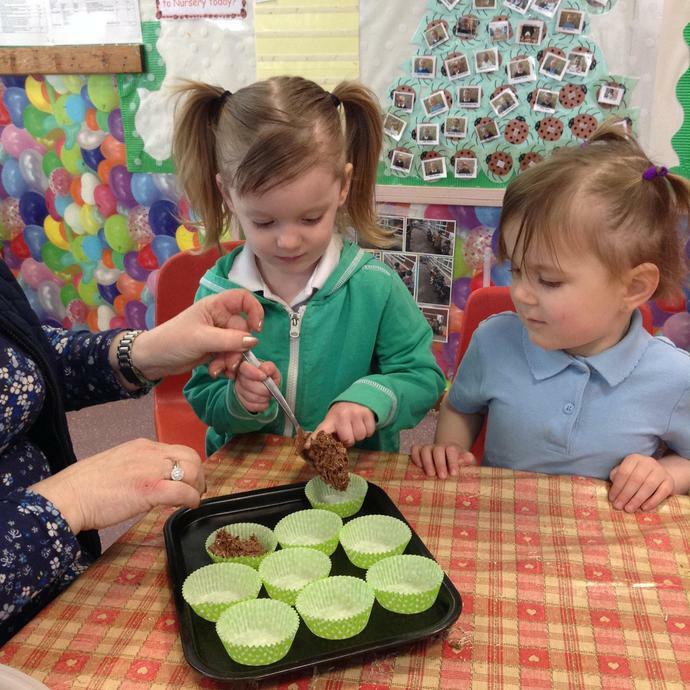 We also made some chocolate nests as part of our tasty Tuesday treats and also sampling some of the fruits eaten by the very hungry caterpillar! 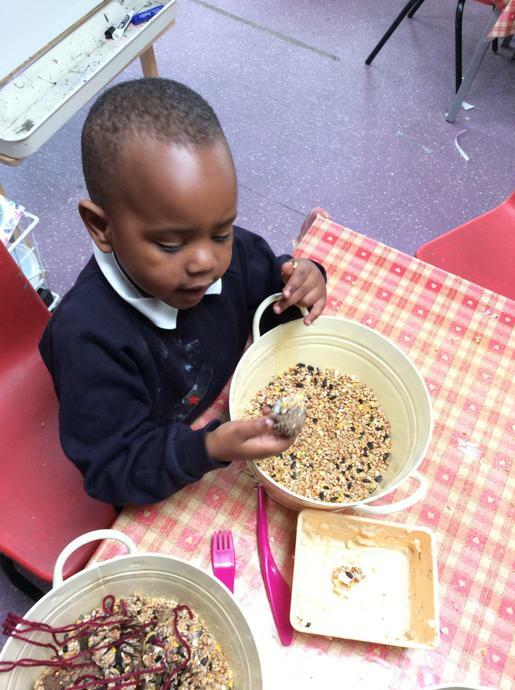 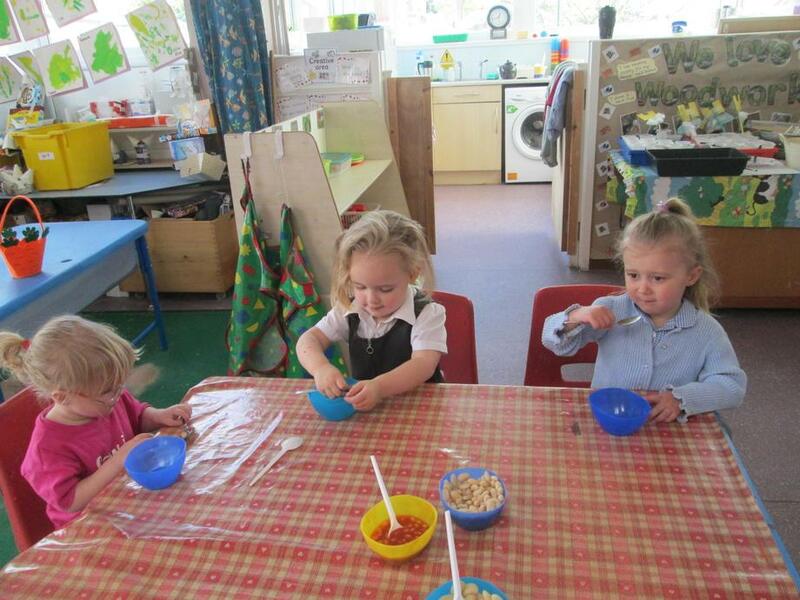 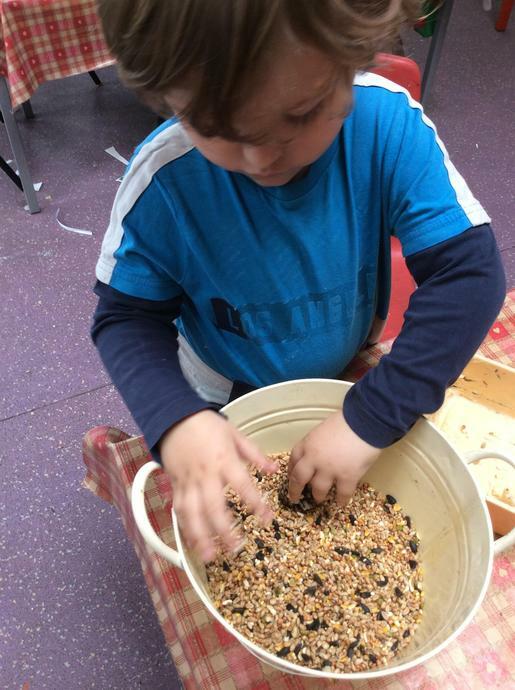 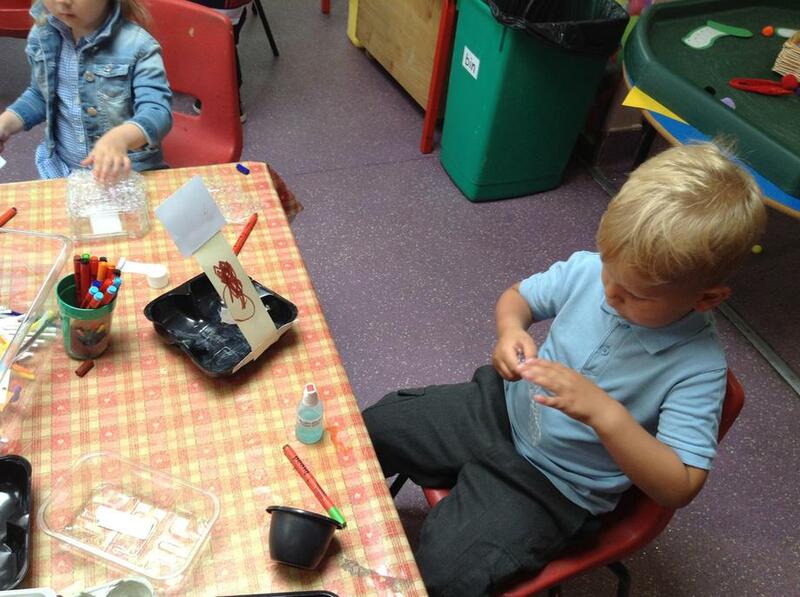 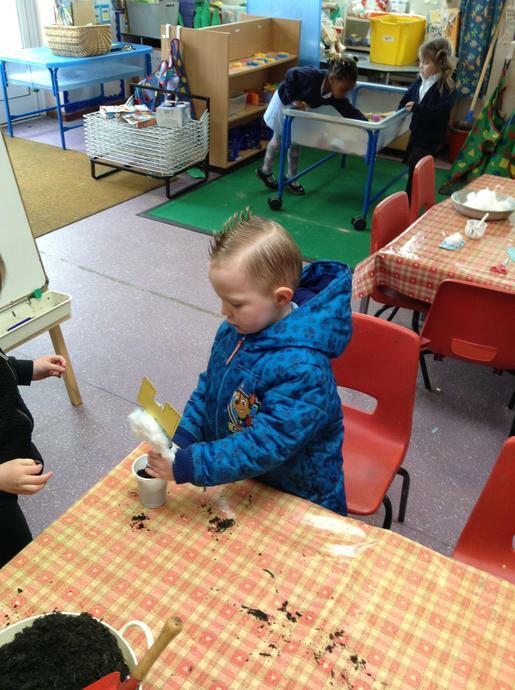 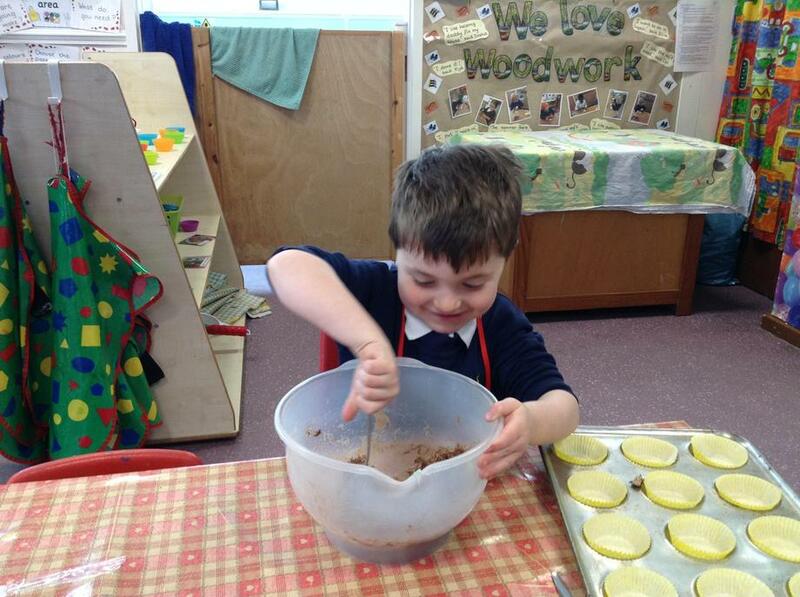 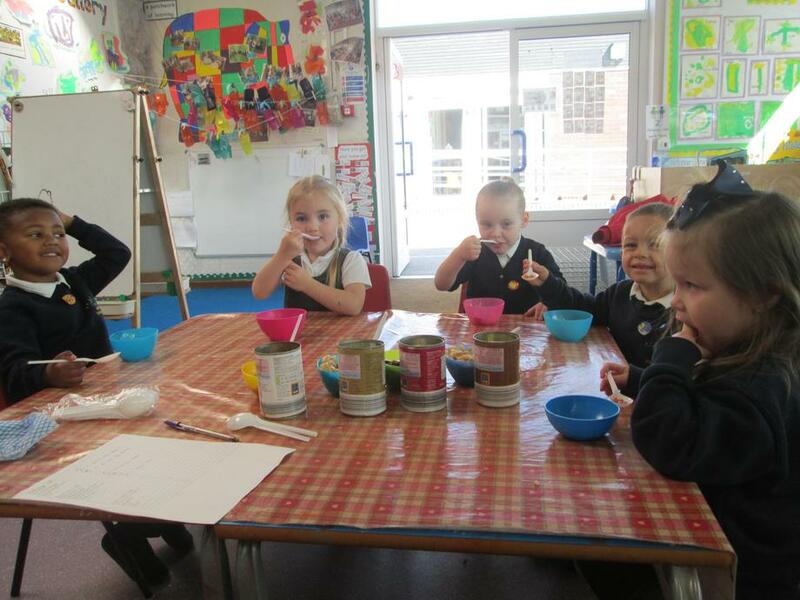 One of the messier activities was making the bird feeders which were made from a pine cone, suet and bird seeds. 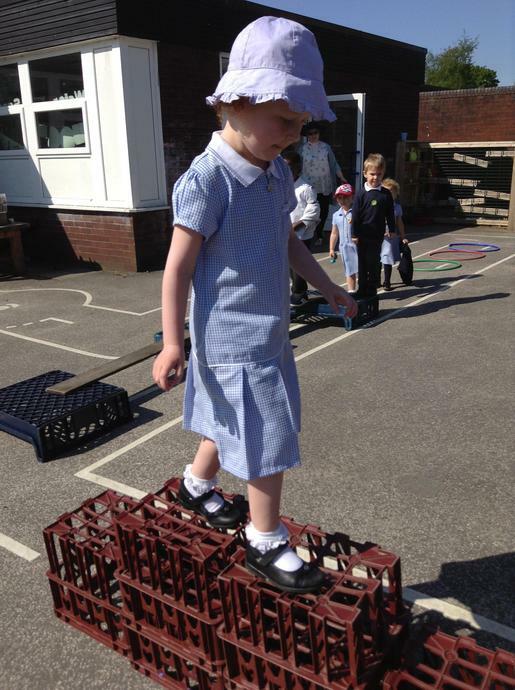 We will have to keep a look out and see if the birds find it! 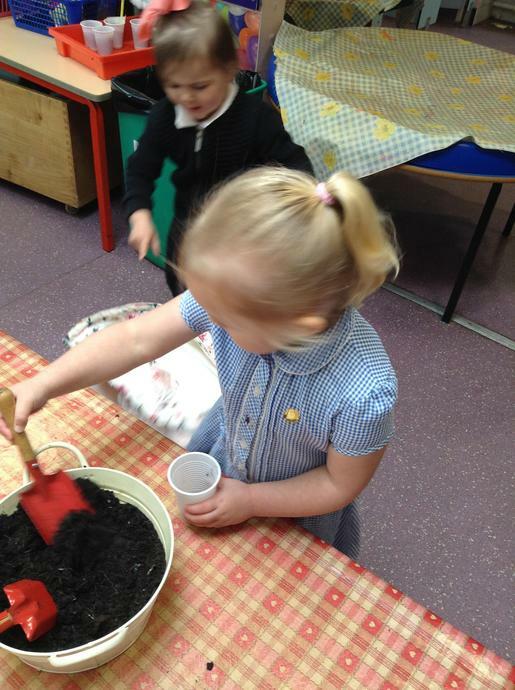 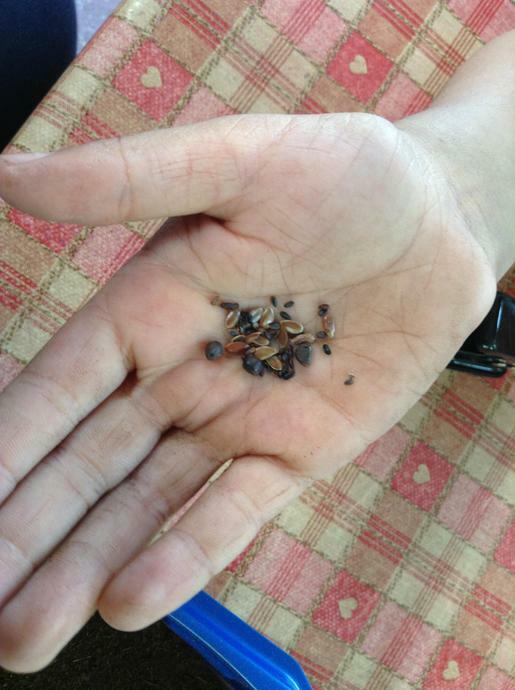 These last 2 weeks, we have been looking at growing seeds and beans. 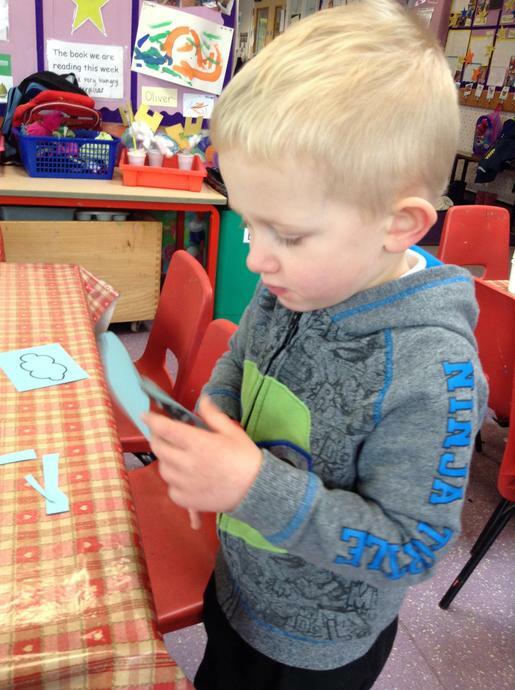 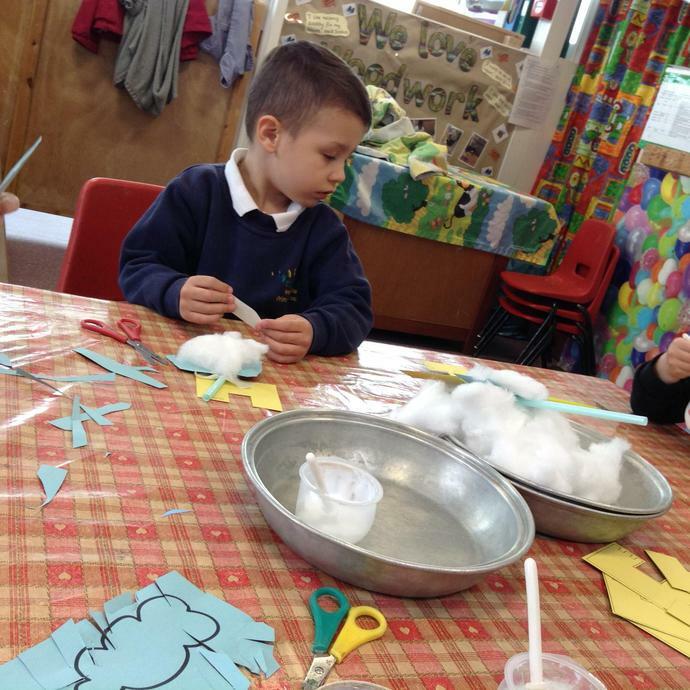 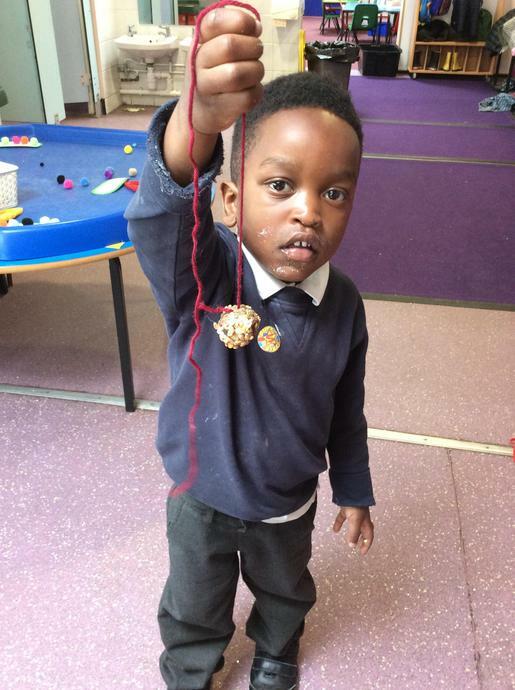 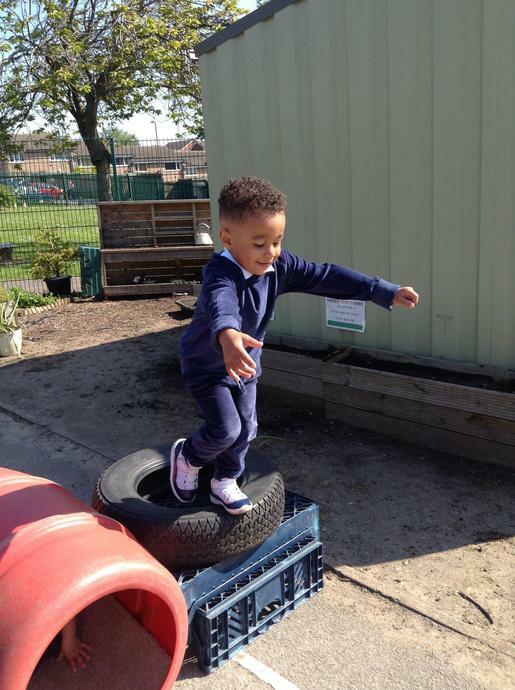 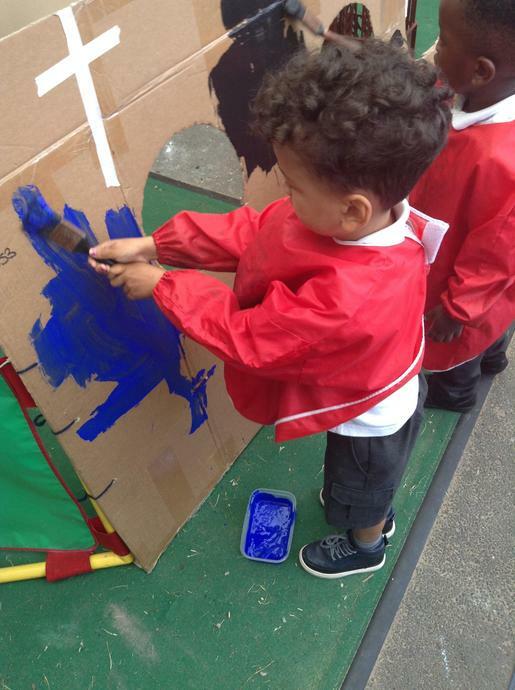 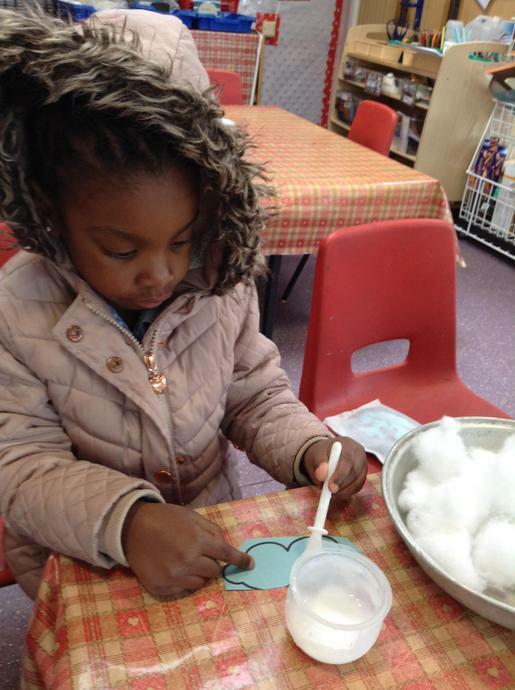 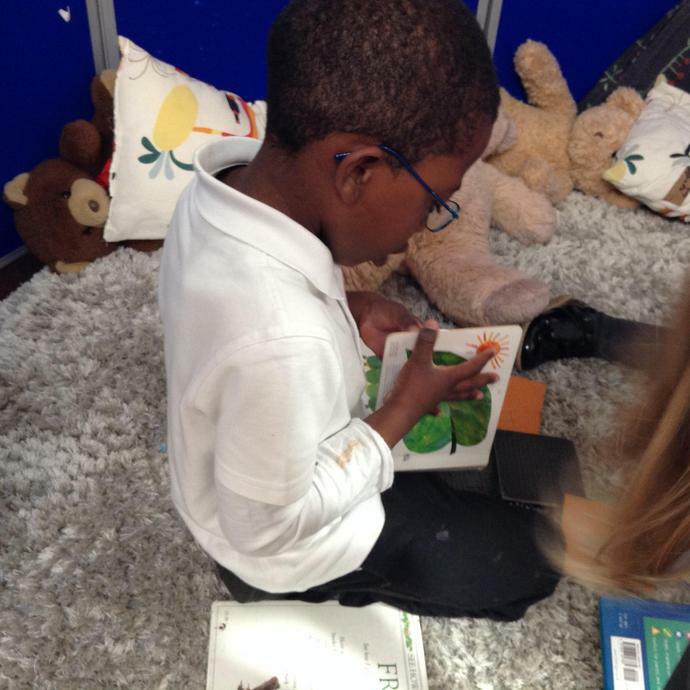 We focussed on two of our favourite stories: Jasper's Beanstalk and The Enormous Turnip. 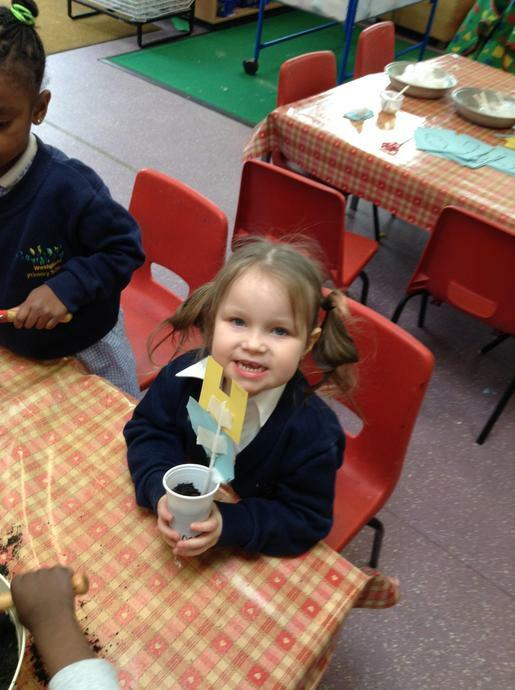 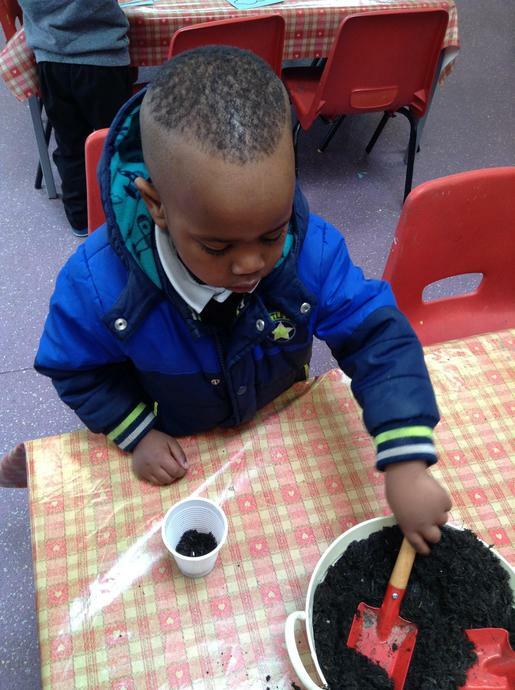 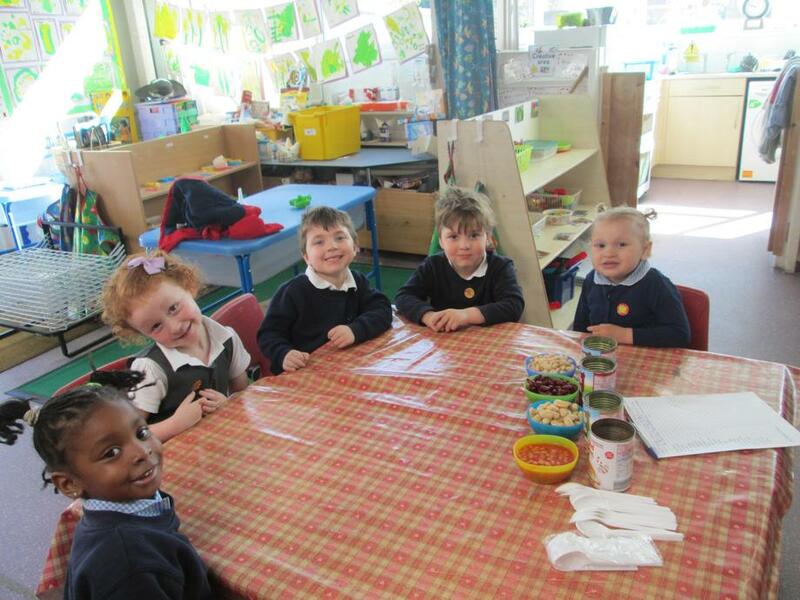 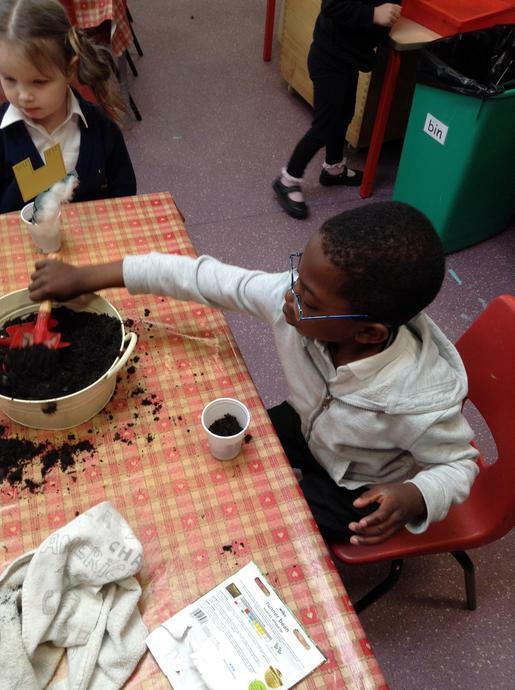 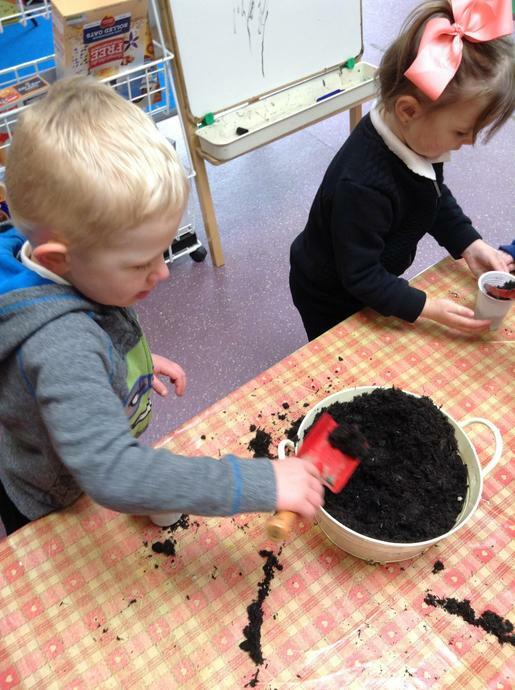 In Week 4, we have continued to plant...a carnivorous garden, sunflowers and cress! 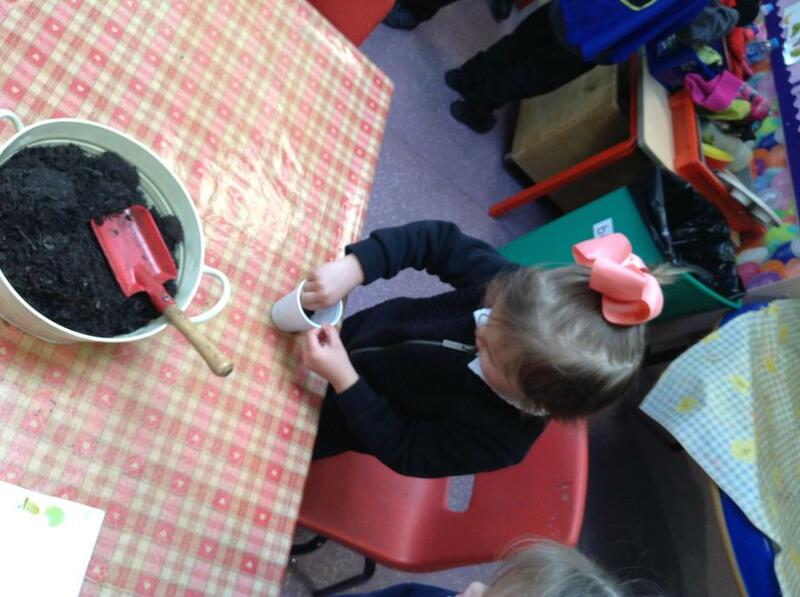 We have planted in compost and in cotton wool....I wonder what the difference will be in how they grow? 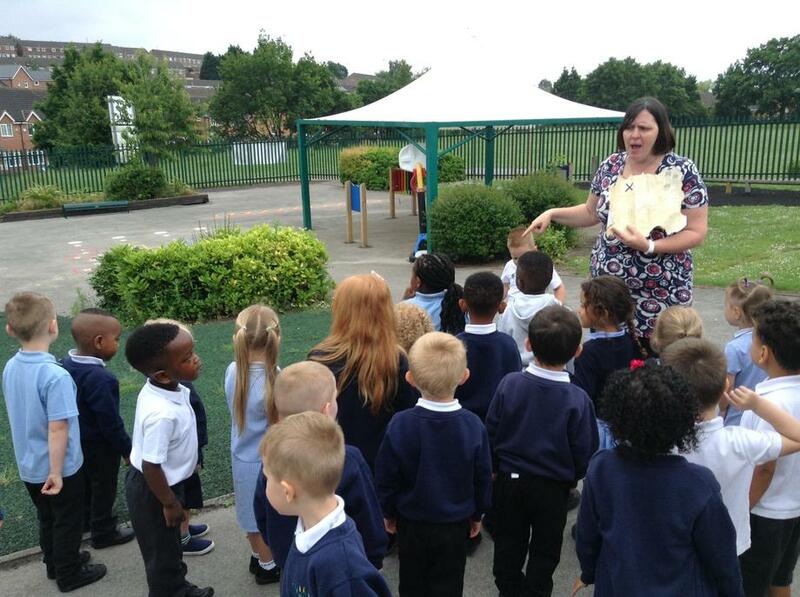 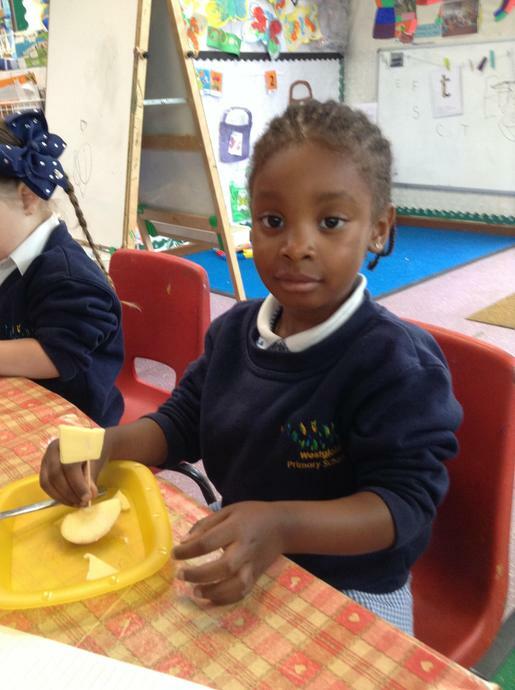 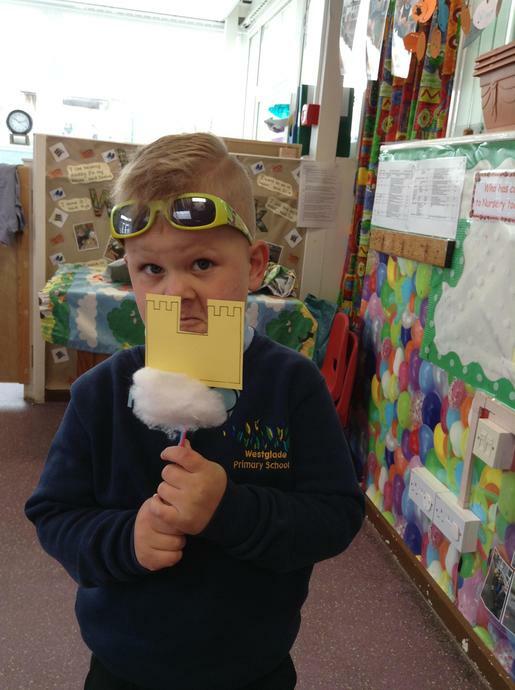 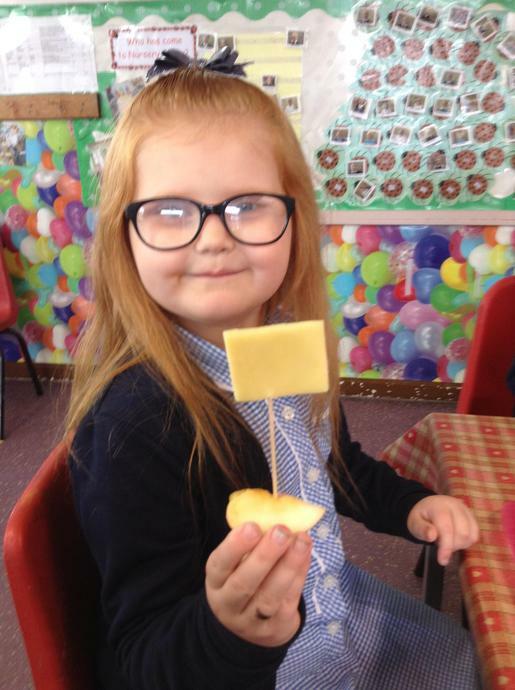 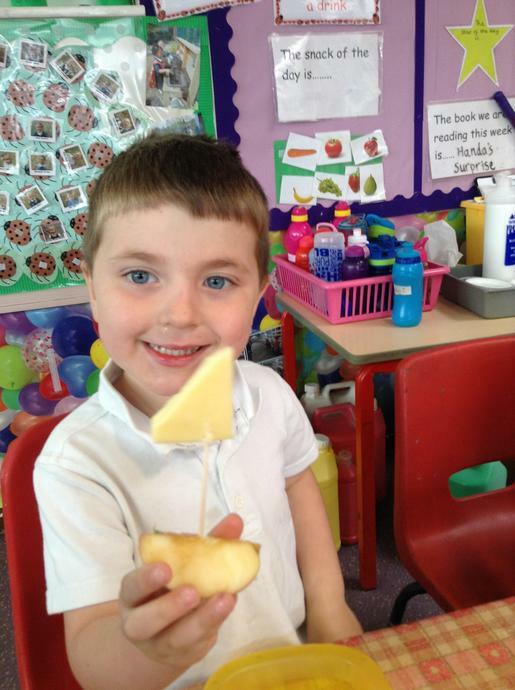 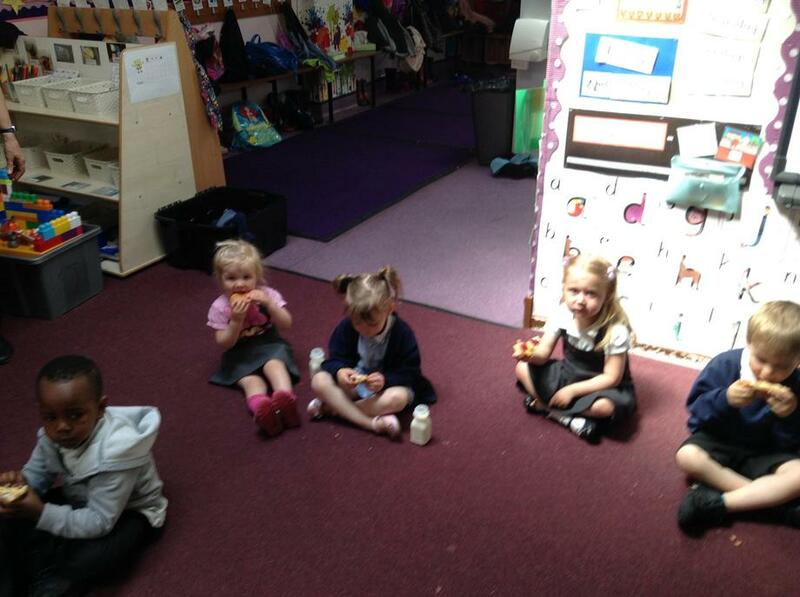 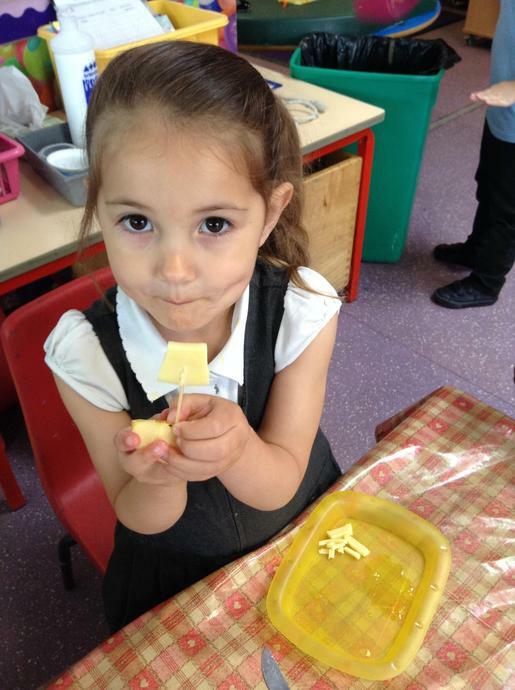 We read the story of The Enormous Turnip, looked at a real turnip and even sampled turnip and swede! 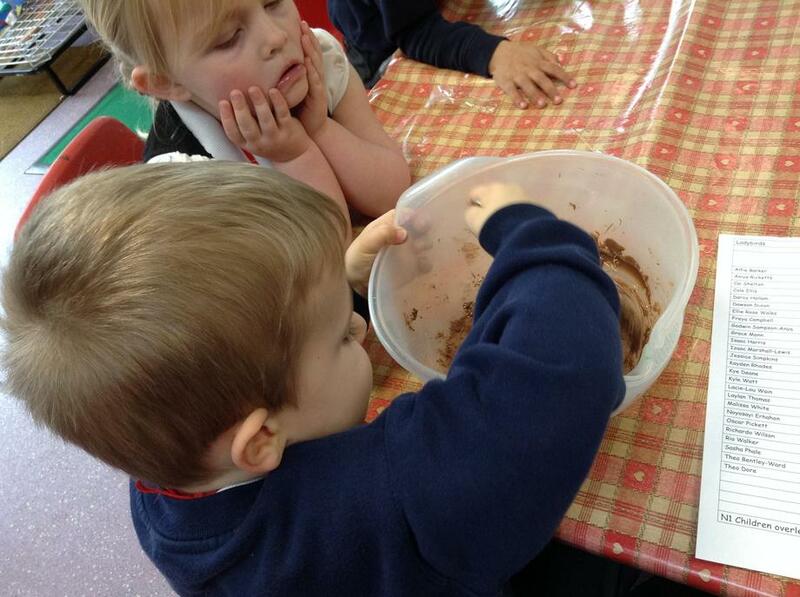 We were surprised how many children tried and ate them! 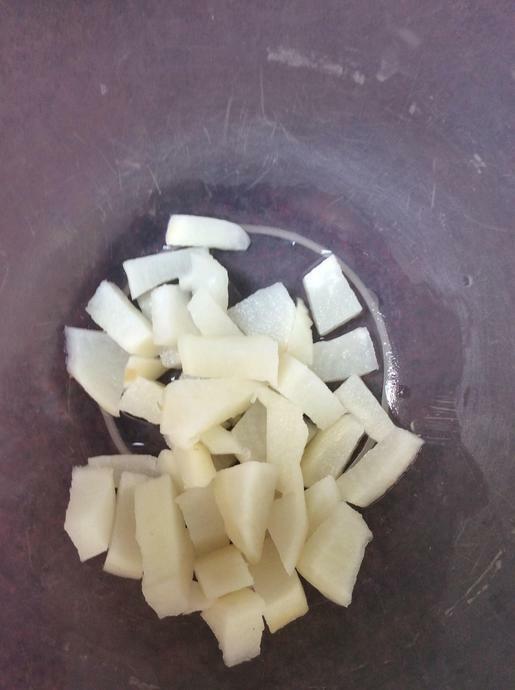 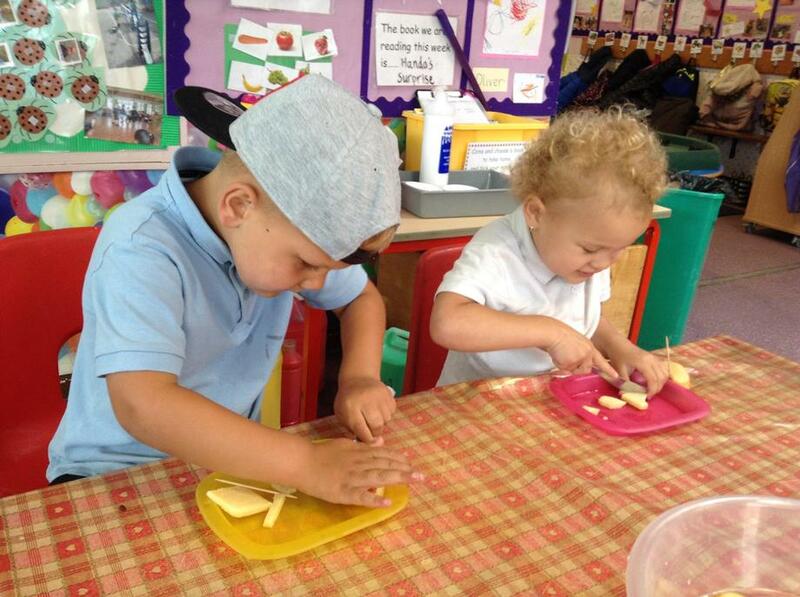 They had a go at making swede mash - although they found this really hard (we had cooked the swede first!). 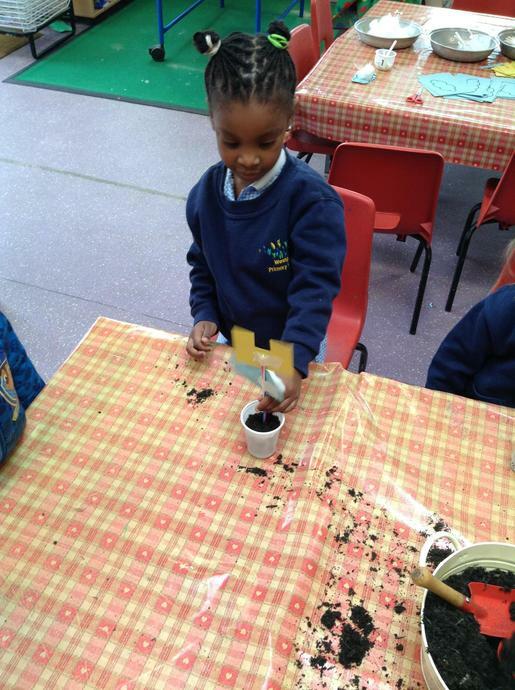 During our Learning Challenge time, we looked at how different vegetables grow (under, along or above the ground). 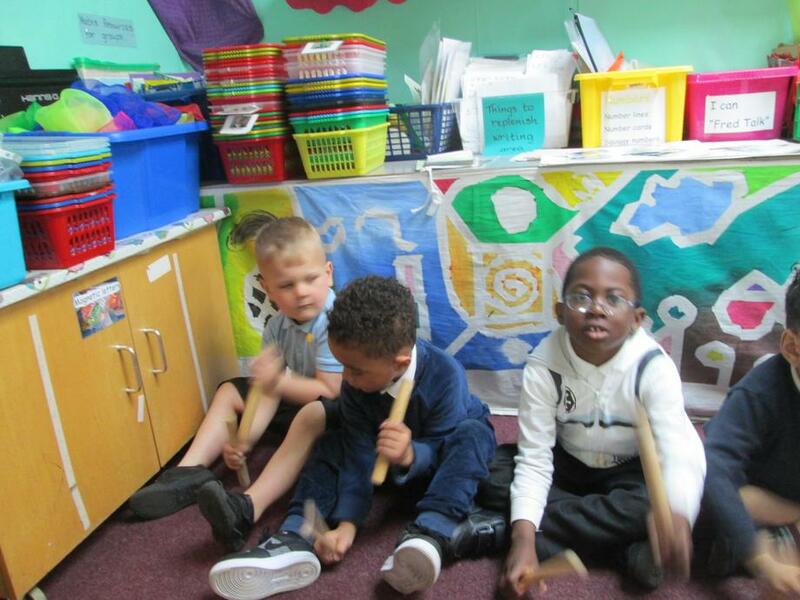 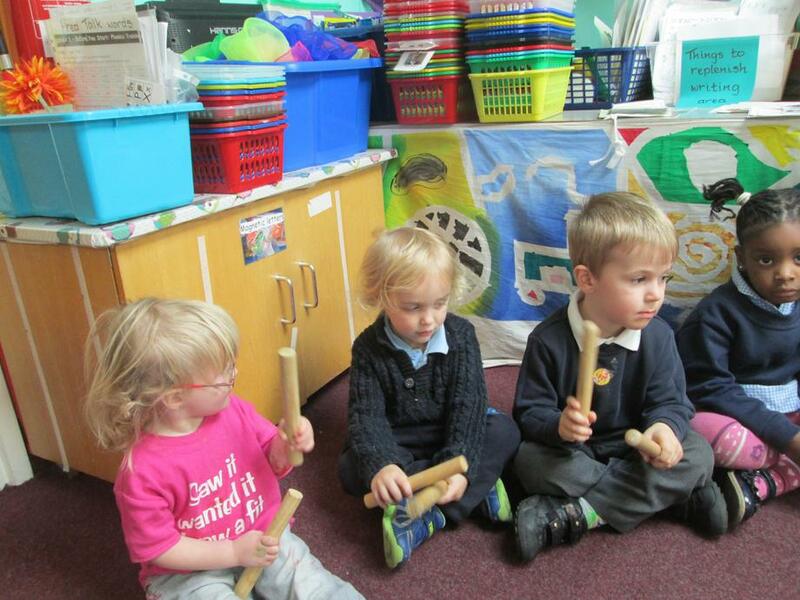 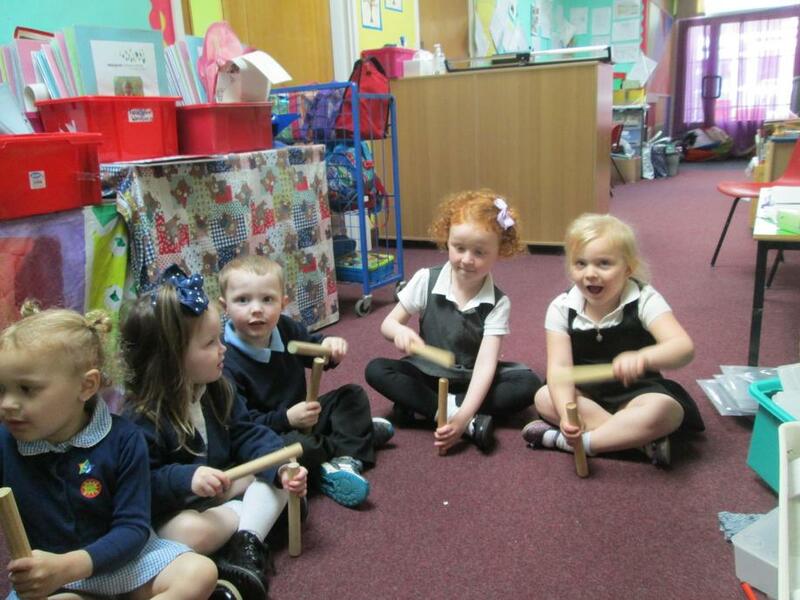 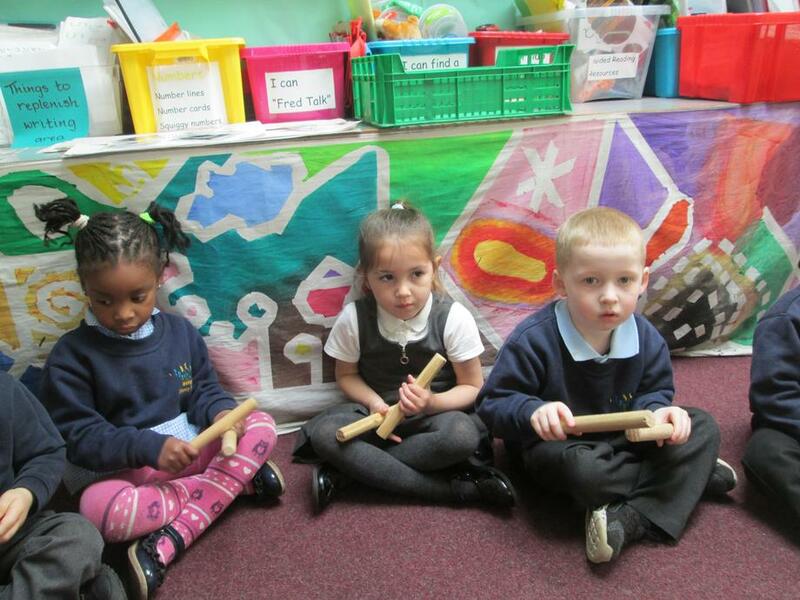 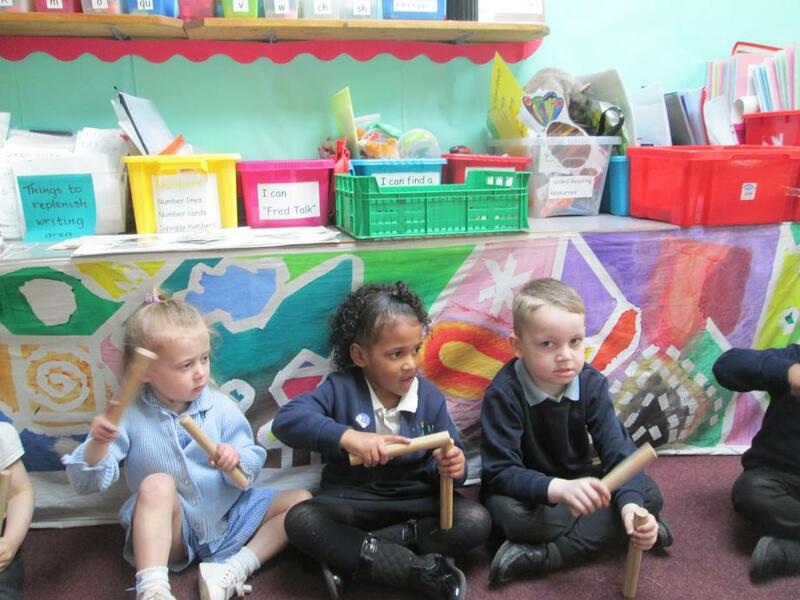 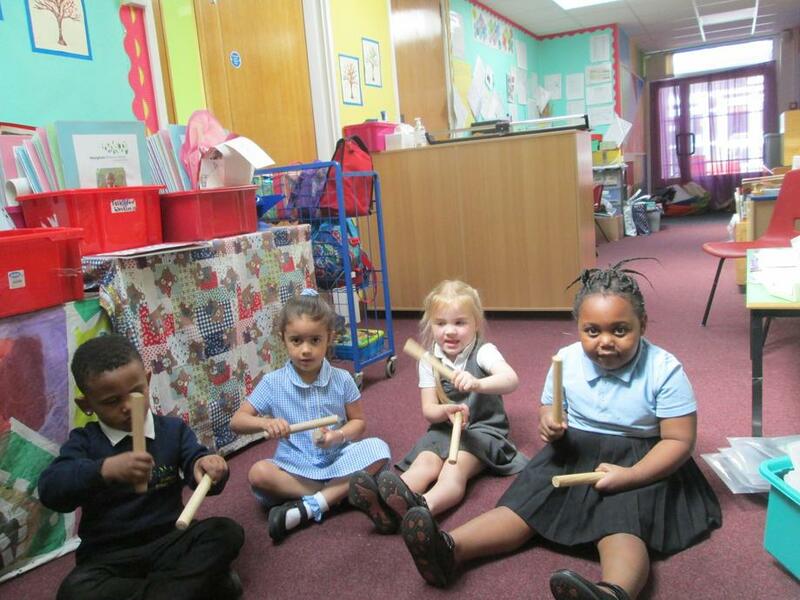 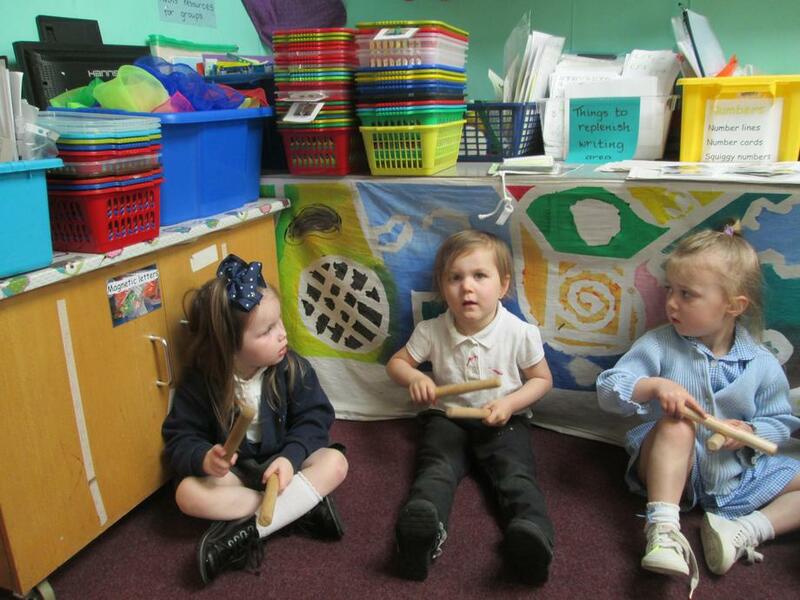 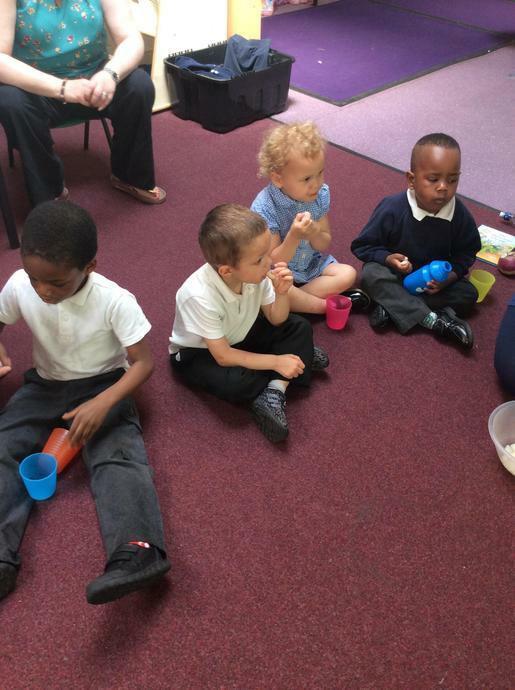 We enjoyed singing new songs using the rhythm sticks. 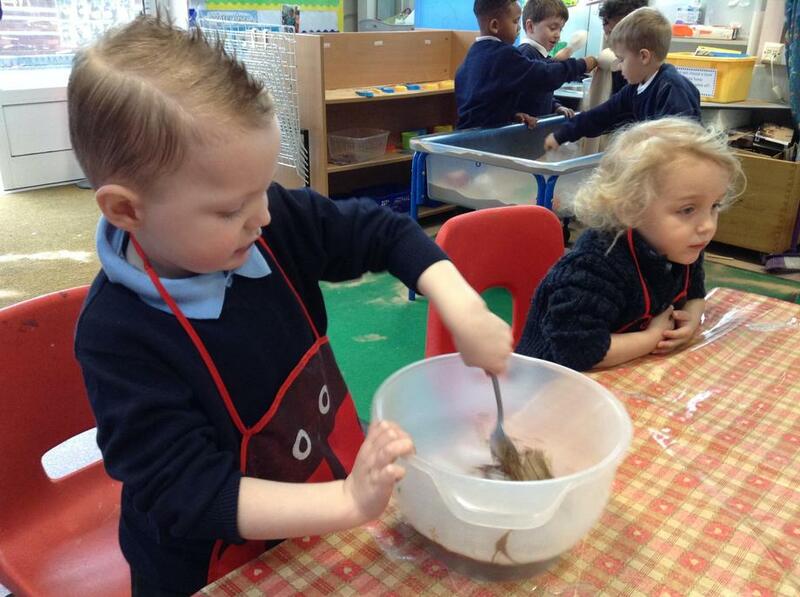 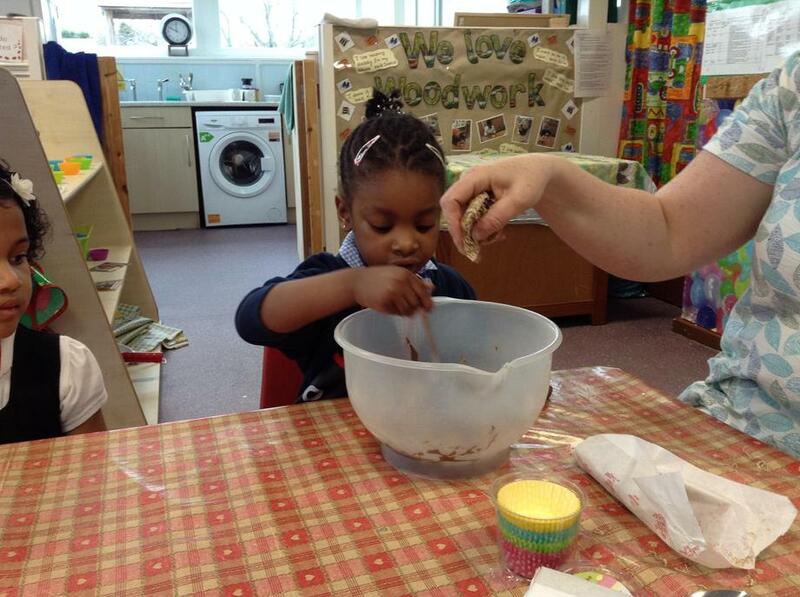 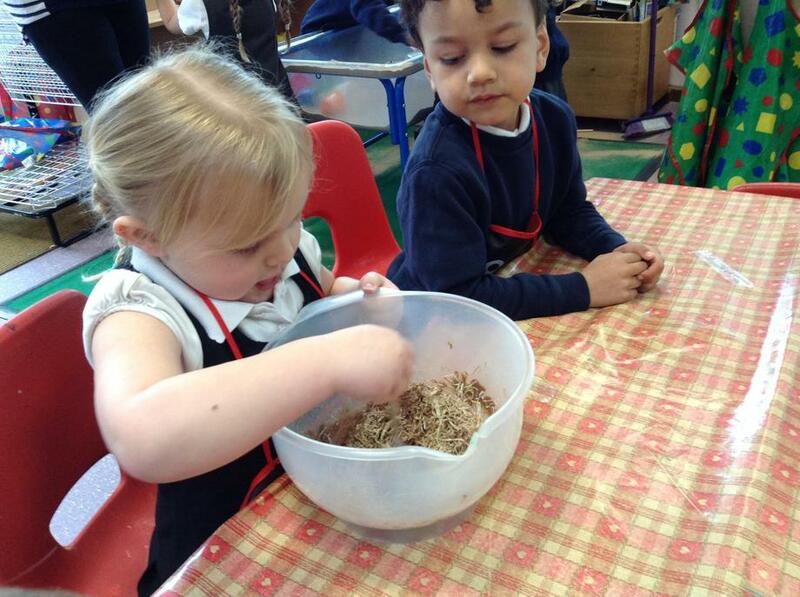 Over these two weeks we have been looking at other things that grow...like bread! 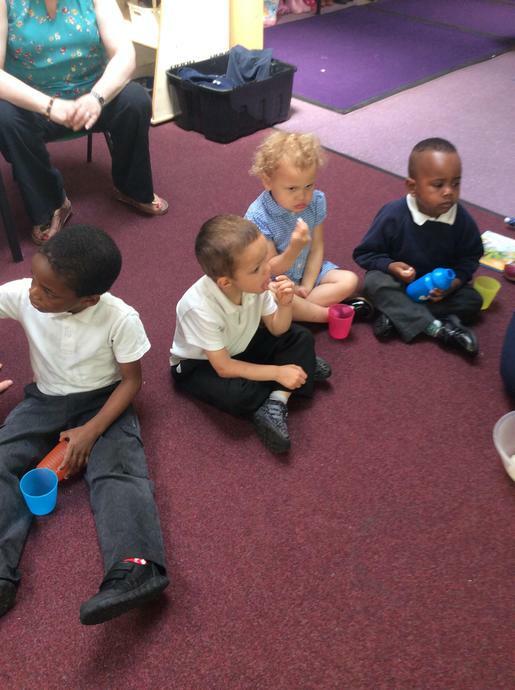 Our two stories that we read were Handa's surprise and The Little Red Hen. 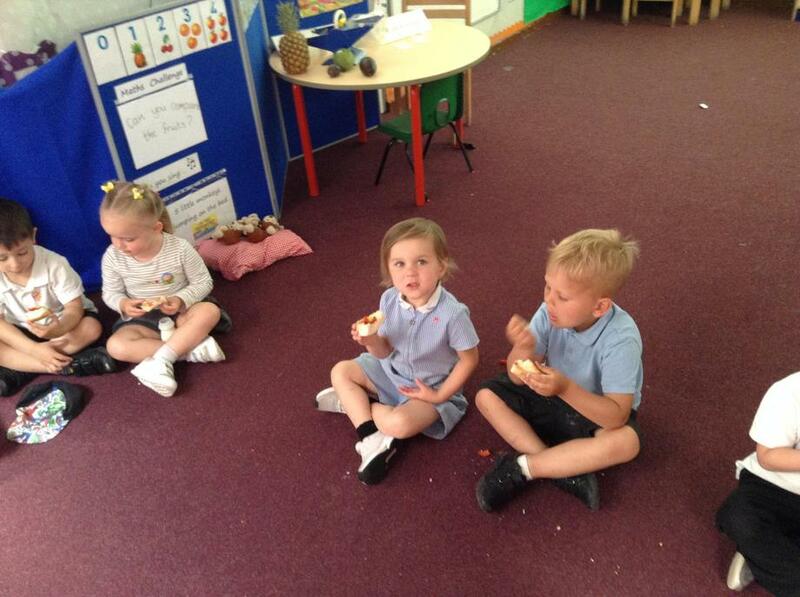 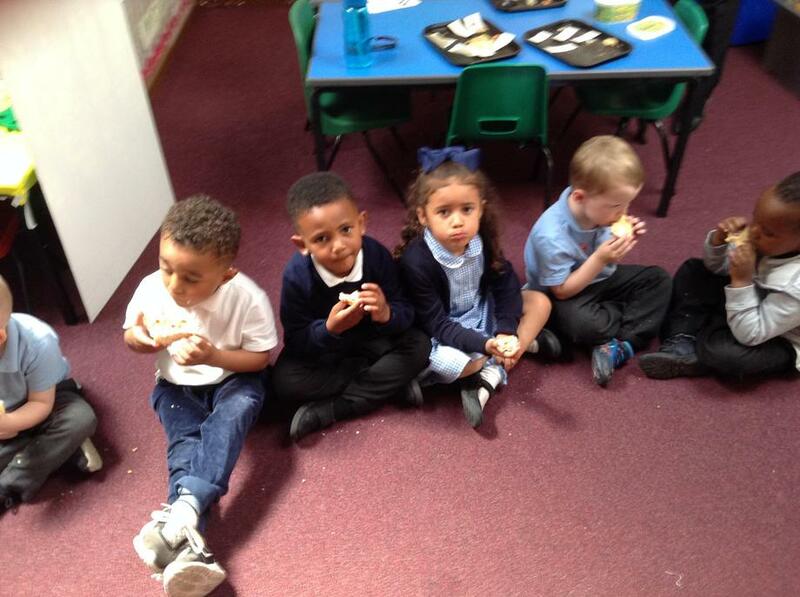 We enjoyed sampling fruits in the story of Handa's Surprise and making our own pizzas (linked with The Little Red Hen's pizza). 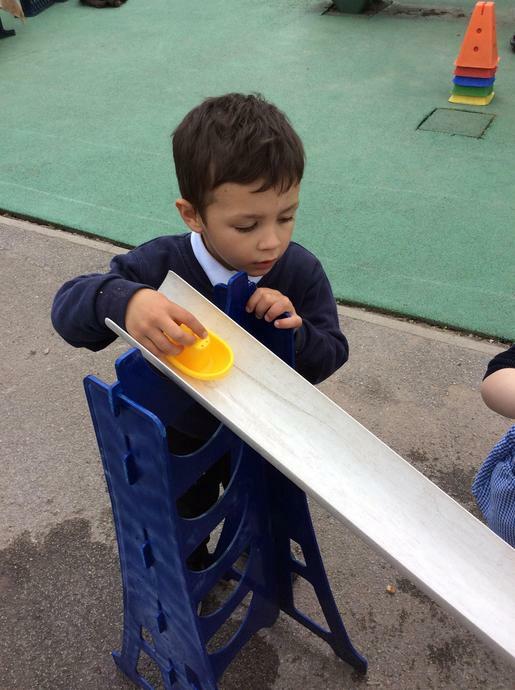 We followed instructions to make bread, went on an obstacle course and printed with fruits. 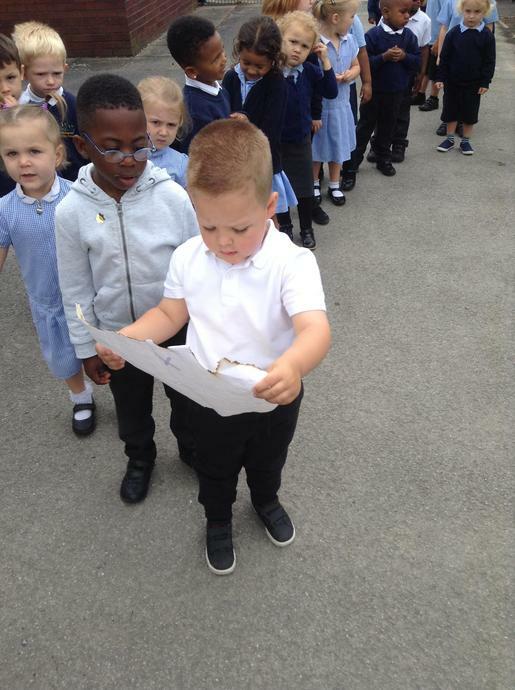 We were very busy as usual! 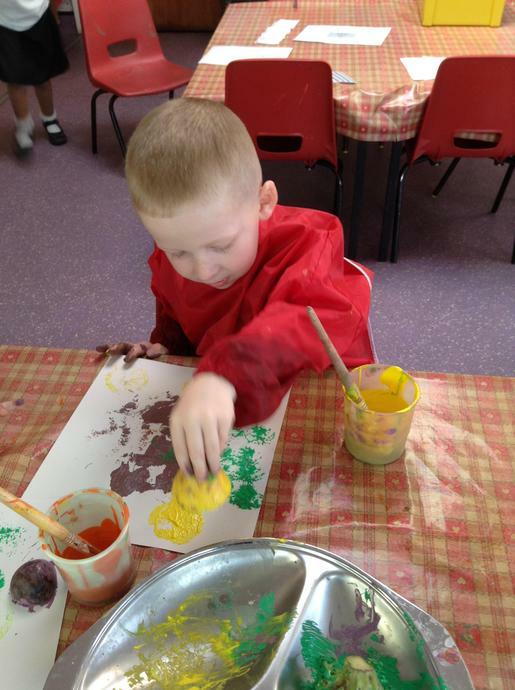 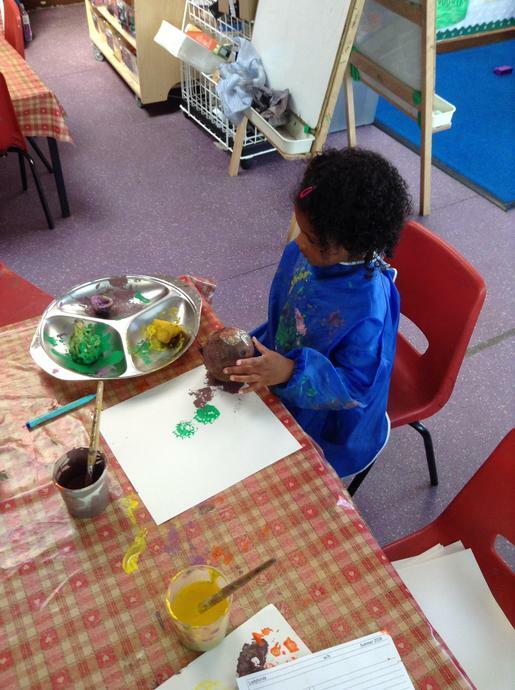 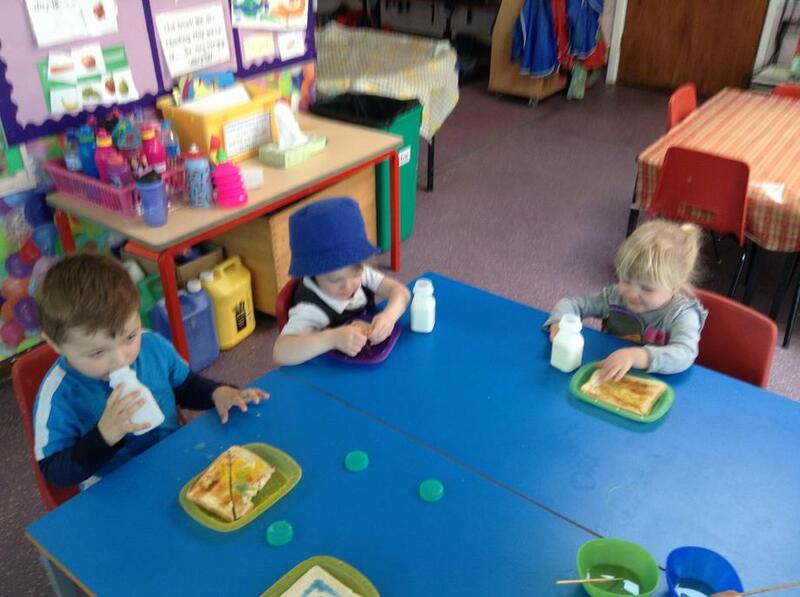 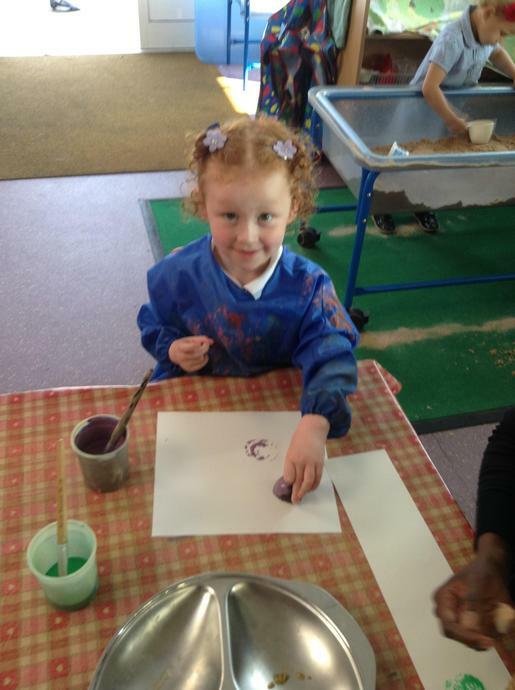 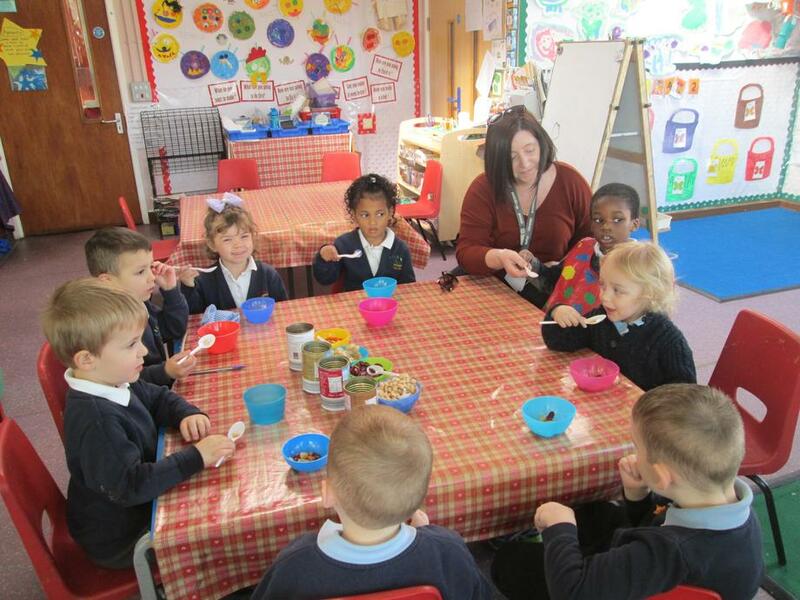 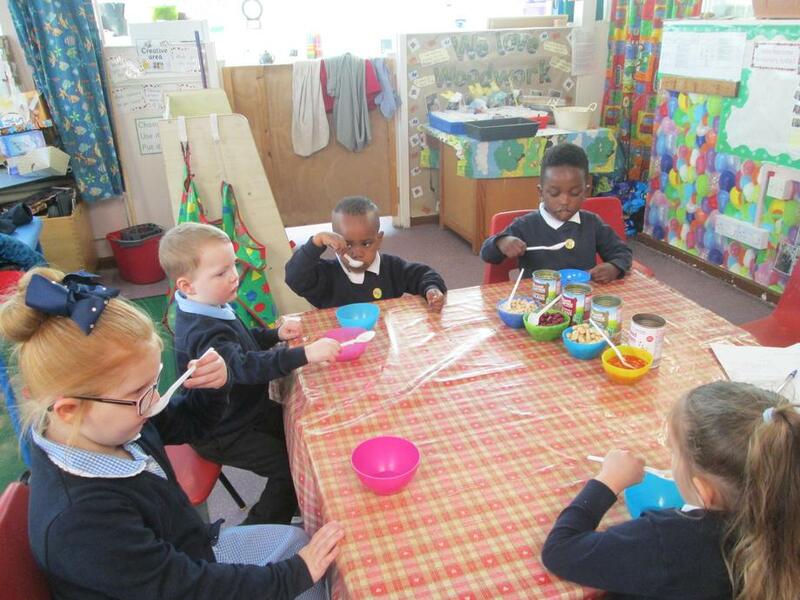 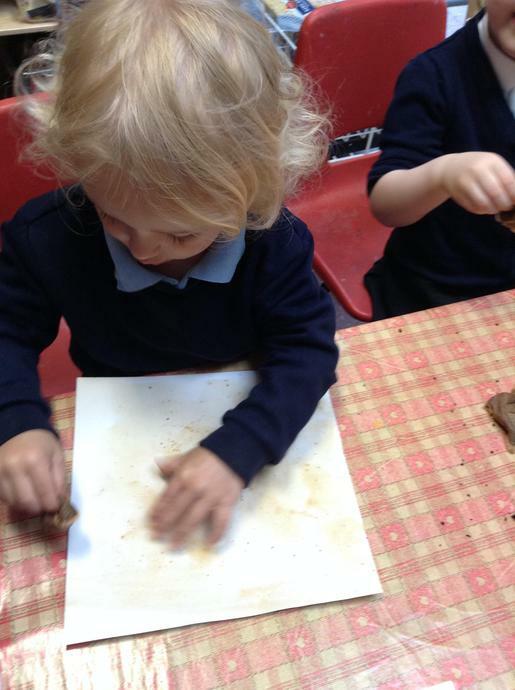 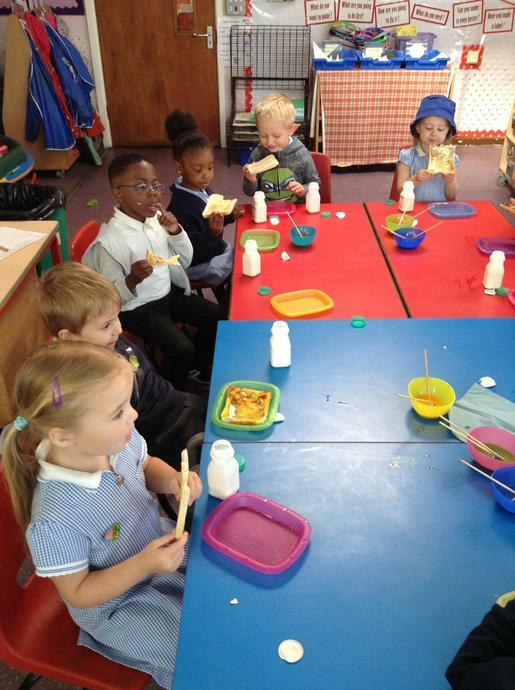 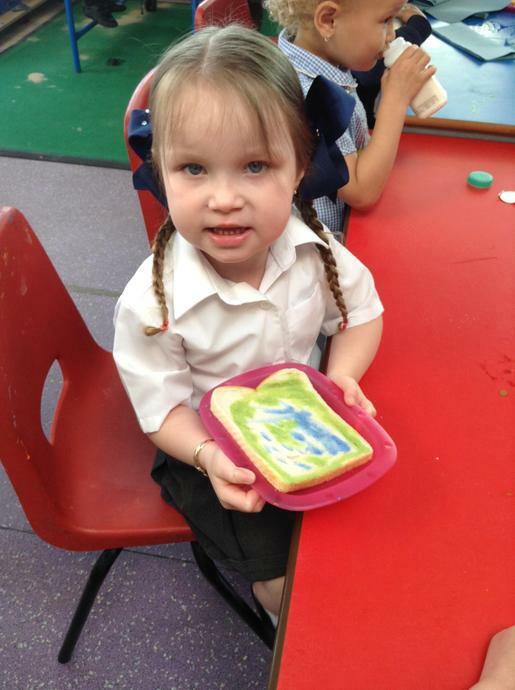 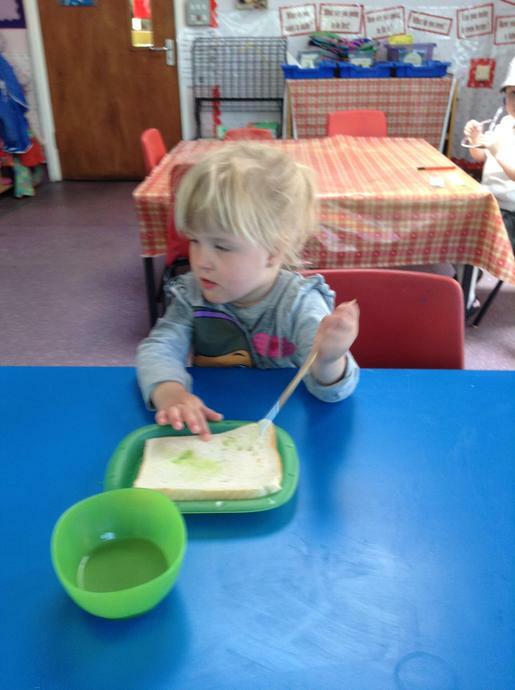 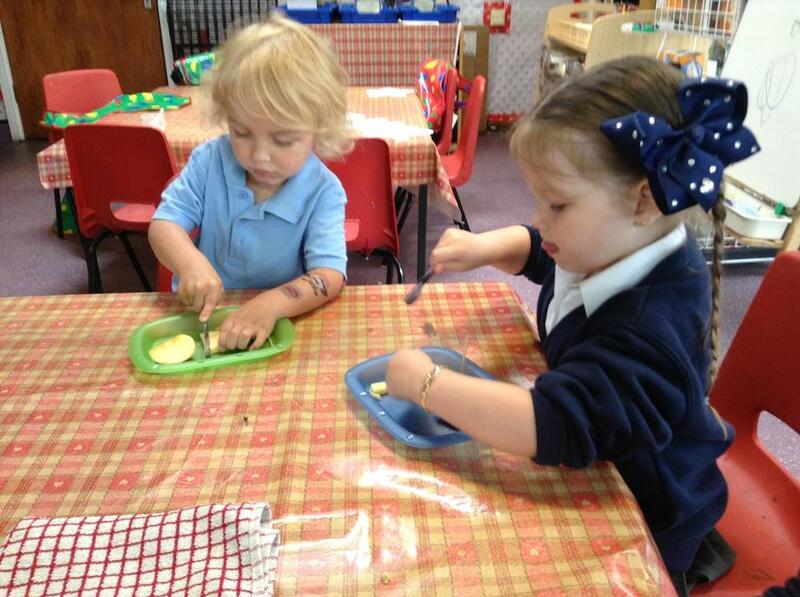 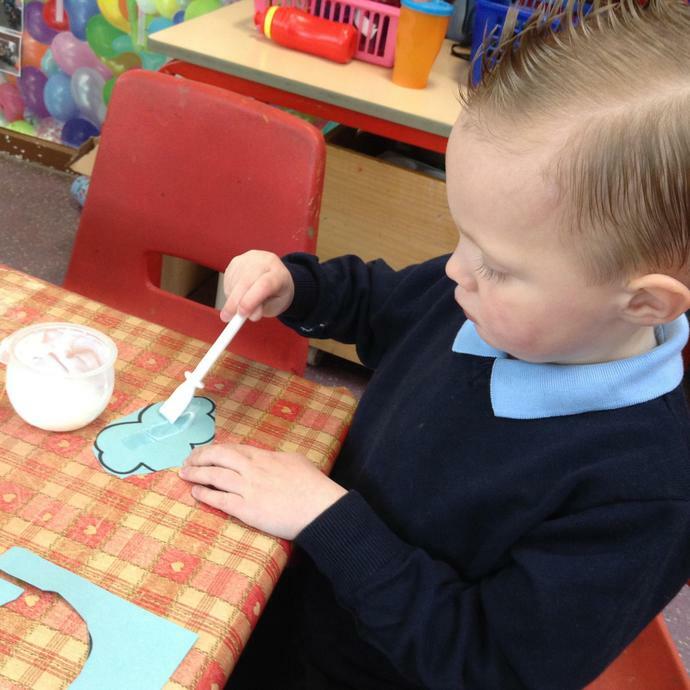 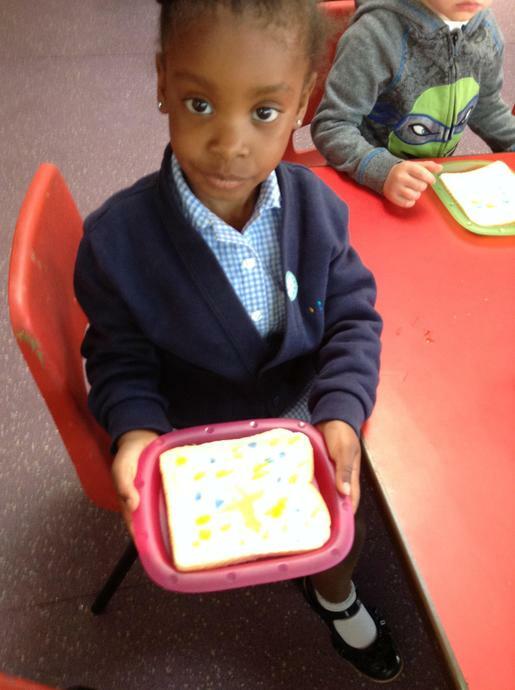 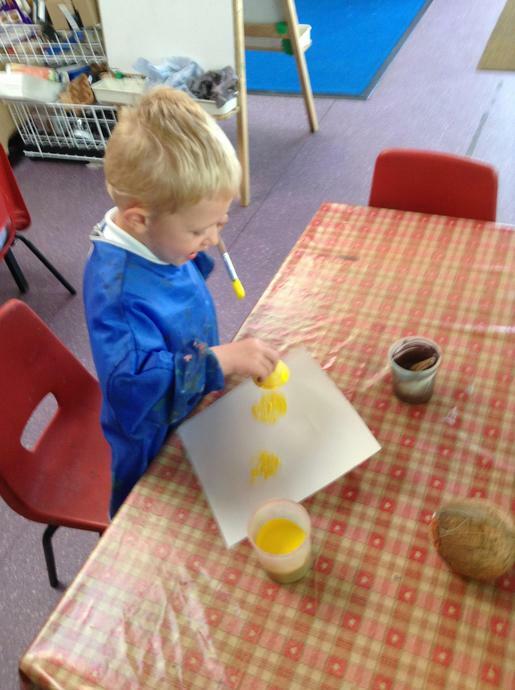 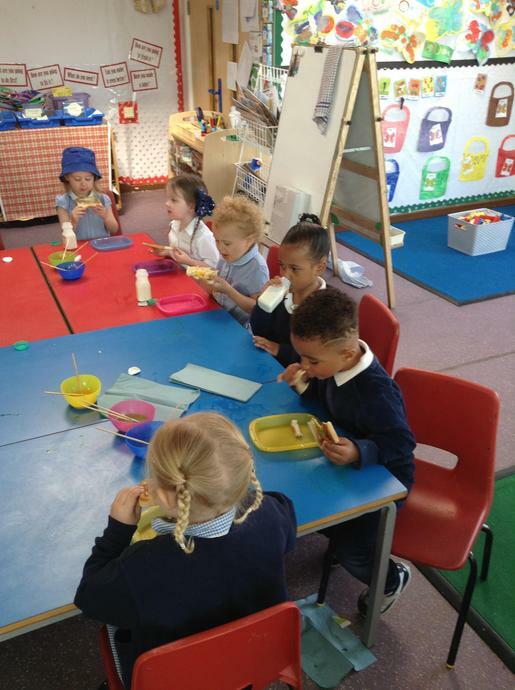 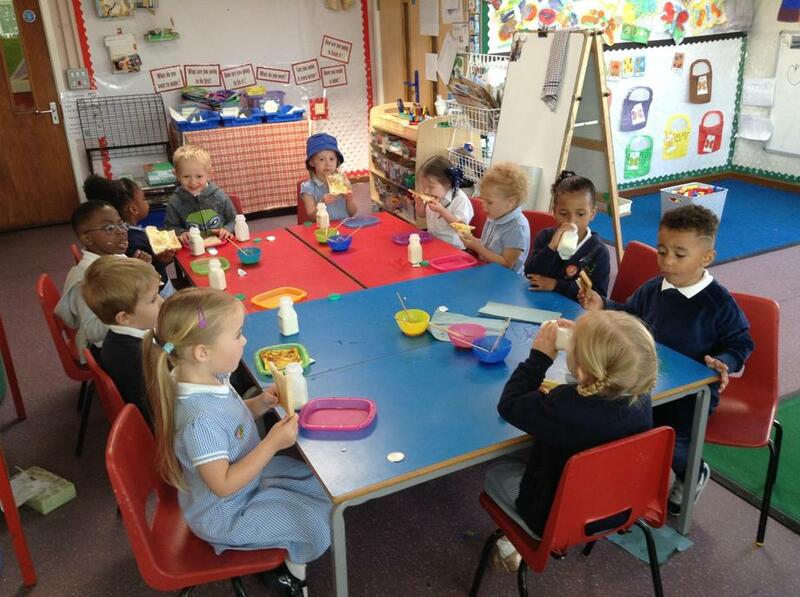 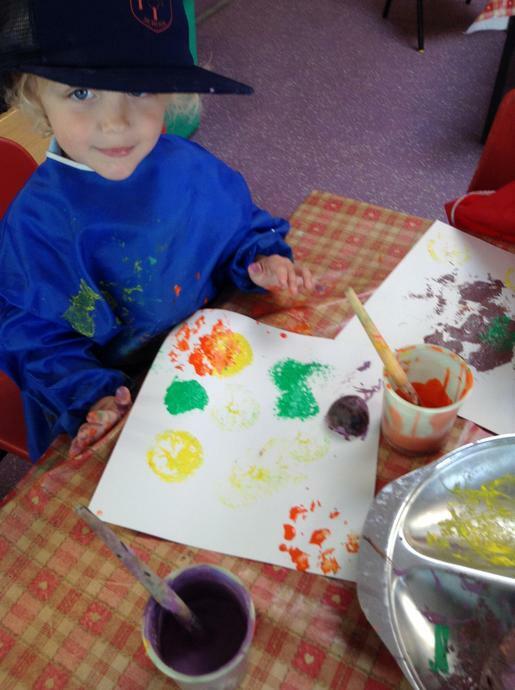 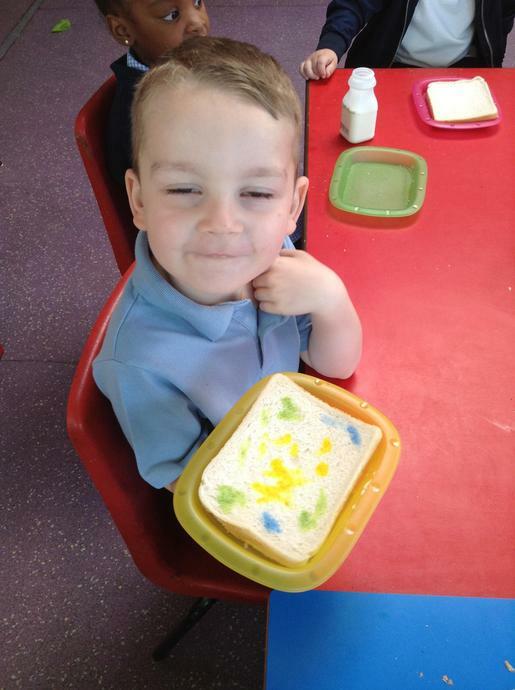 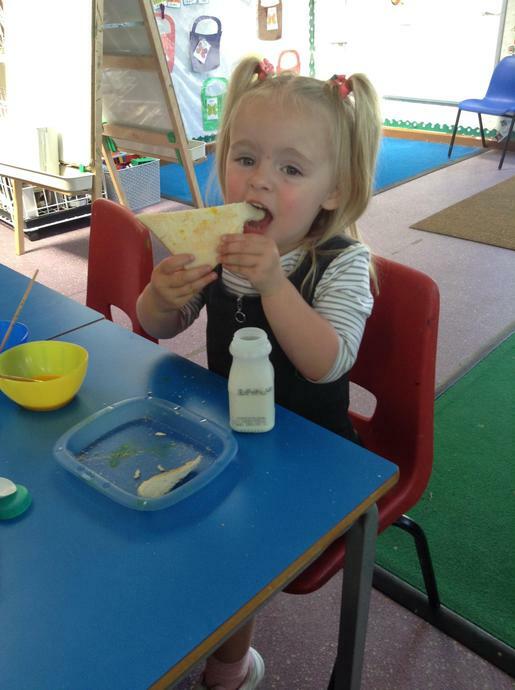 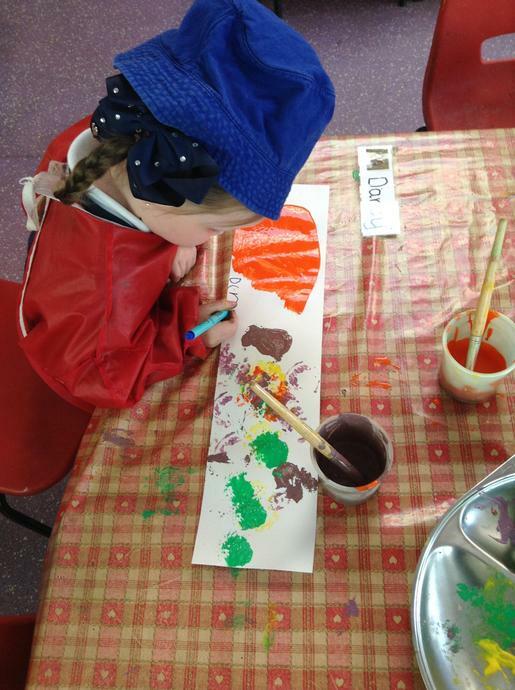 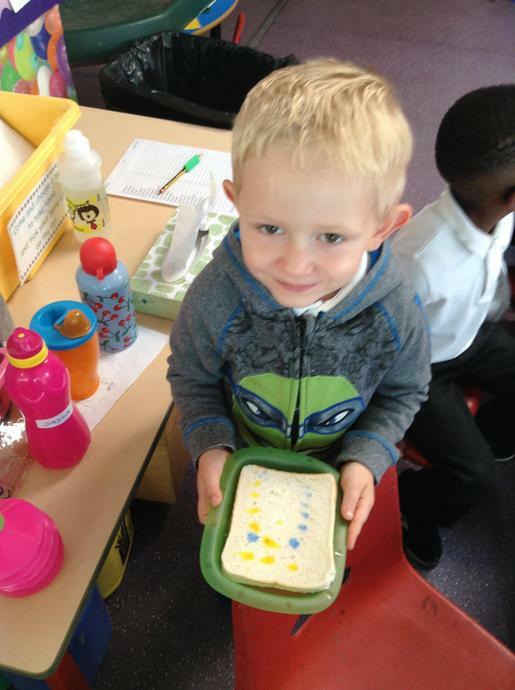 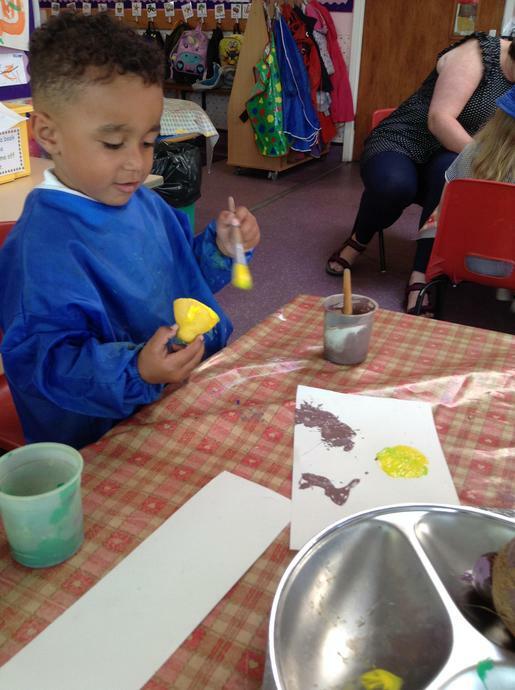 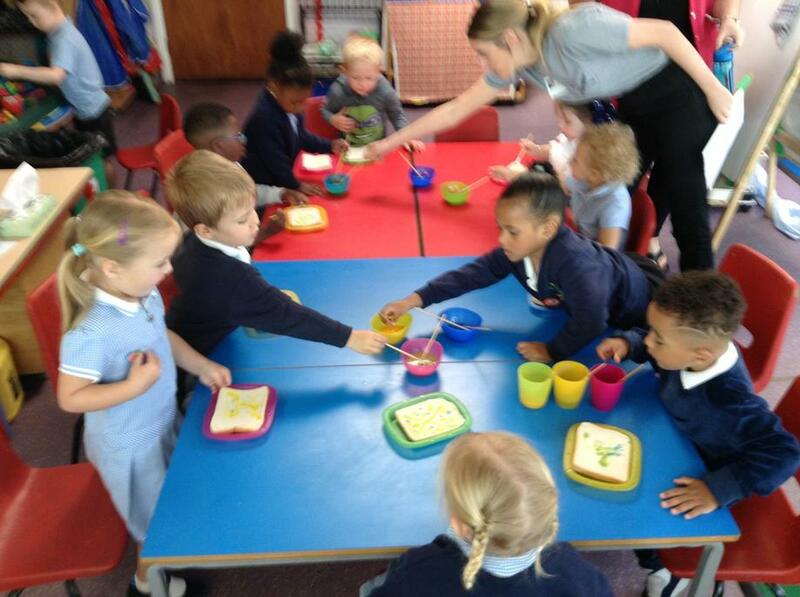 We even painted bread with special 'paint' (milk and food colouring), toasted and then ate it. 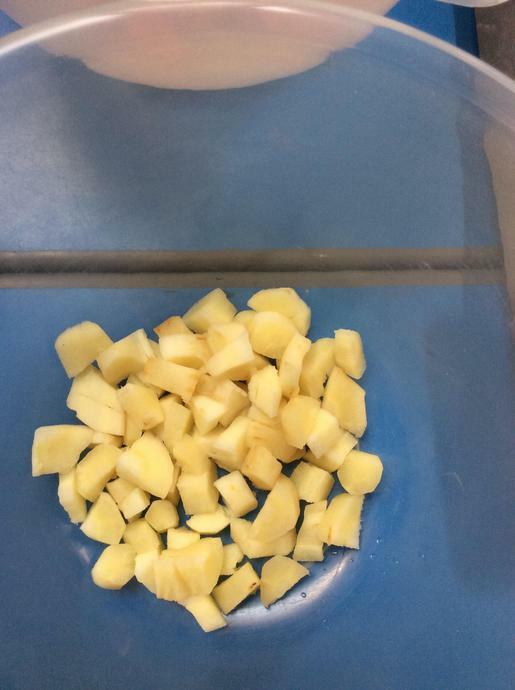 It worked surprisingly well! 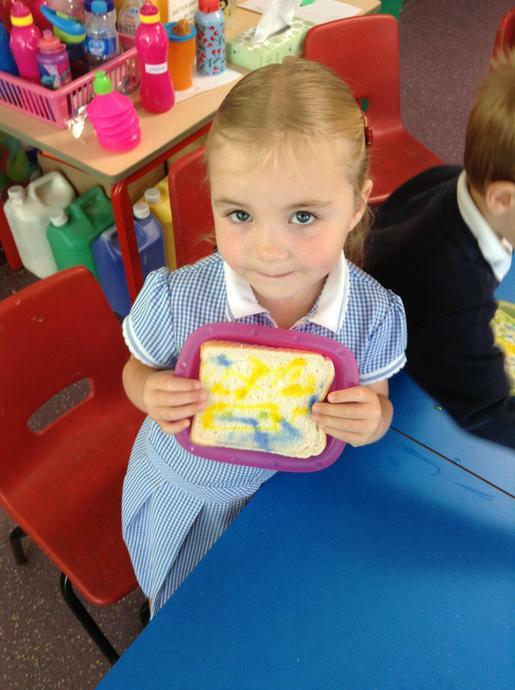 Have a look at our amazing learning!